The Tasmanian bushfires that started with dry lightning strikes on January 15th burned for many weeks. 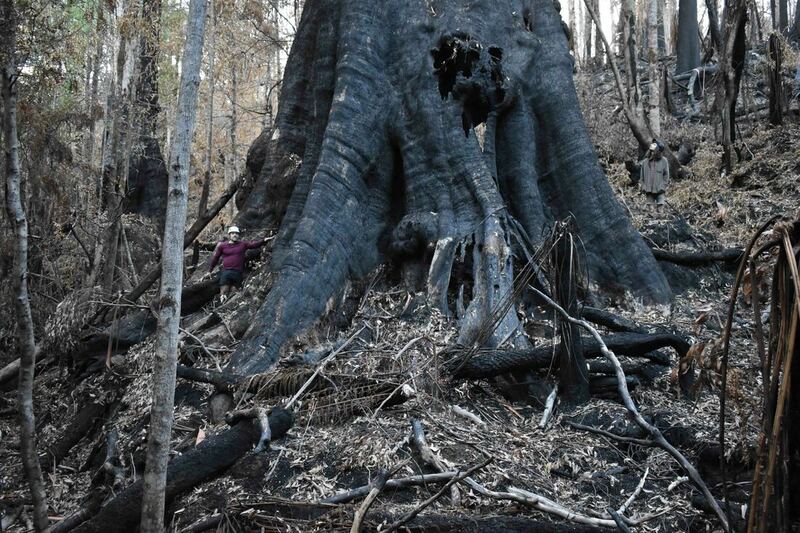 These fires have had a devastating effect on most of the 500 year old giant trees that lived in the Southern Forests, inland from Geeveston. 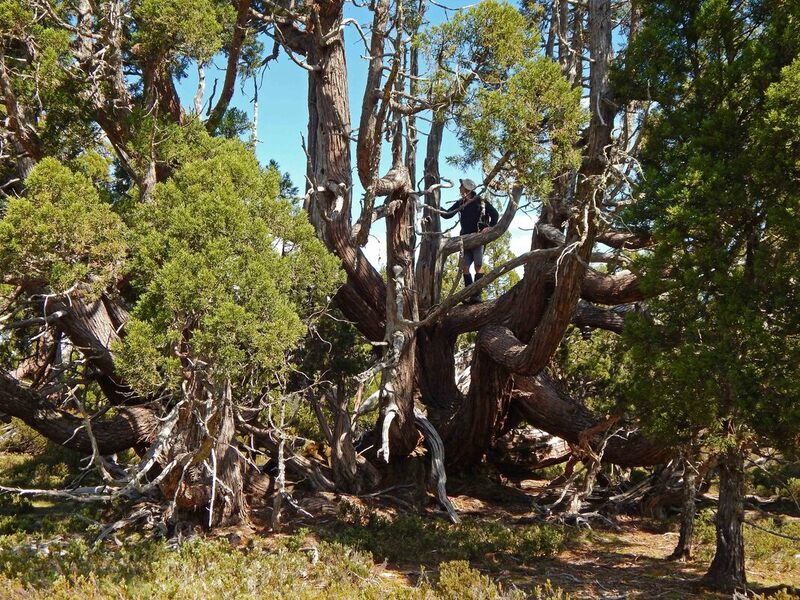 These very old trees are particularly susceptible to fire due to their various hollows, areas of rot and the centuries of accumulated ground debris consisting of fallen branches, bark, twigs and leaves. Most of these older trees have been killed, including some that have totally collapsed into an incomprehensible mess. Some of the living trees cling to life standing on blackened stilts, probably likely to fall when the next big wind storm hits. A lucky few have escaped with only a surface burn and could live for many years. A list of some of the assessed trees is included below, however, there were many trees that we were unable to access due to ongoing road safety works in those areas. 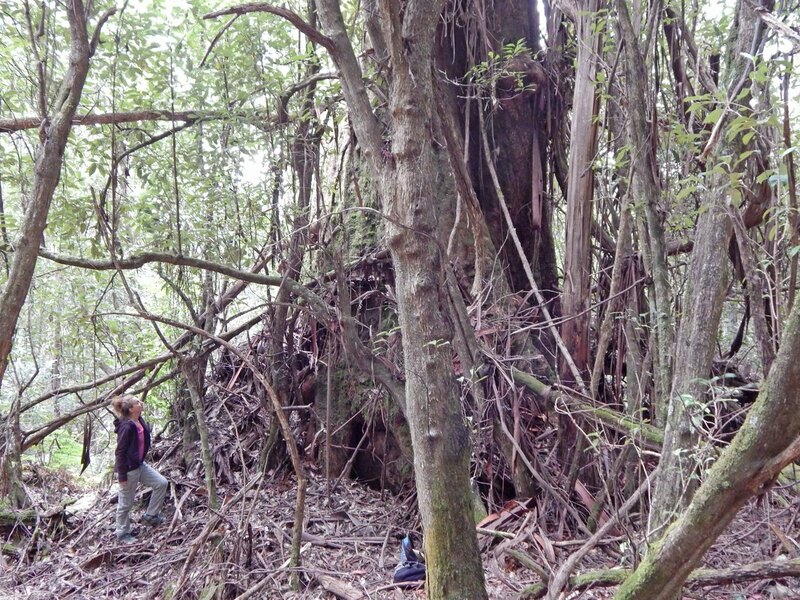 Above: The incredible burnt out base of Bigfoot - how this tree is still standing is anyone's guess! 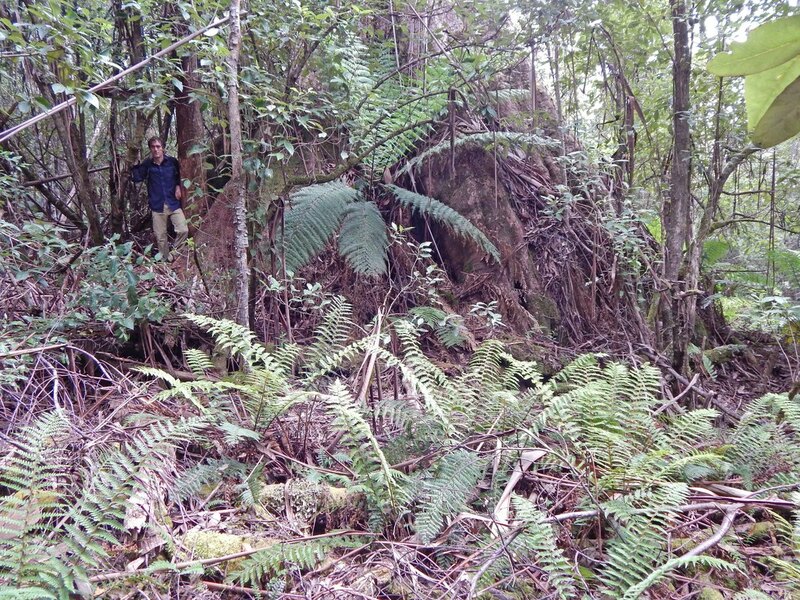 Note the collapsed tree ferns - this view of the tree was previously impossible due to the rainforest understorey. Below: Amazingly, the Kermandie Queen is still alive and standing after the burn that has now made it see-through! The view from a giant Shorea faguetiana - note the epiphytic orchids, vines and ferns on the branch. Huge ​Shorea gibbosa, Roman Dial on the right gives scale. 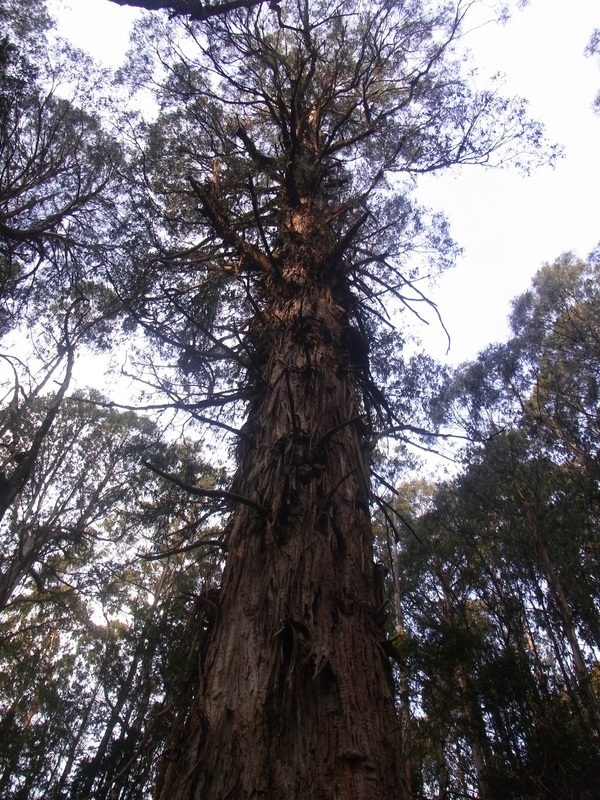 Some wonderful old trees are visible on the way up Mt Donna Buang from the township of Warburton. 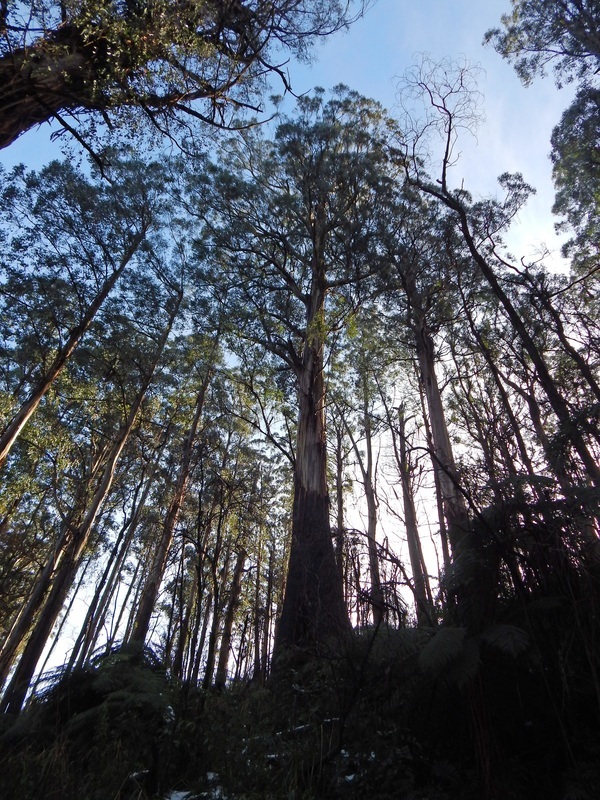 Many of these mature mountain ash trees have intact crowns and despite their high altitude, some individuals exceed 85m in height. 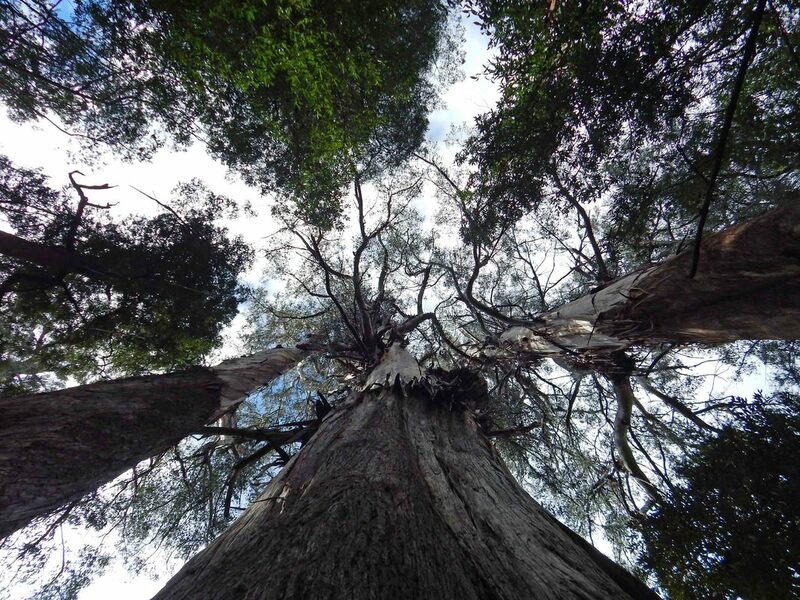 The tree photographed below came in at just over 89m tall and provided fine views of a forest in its prime. Trees that time (fire) forgot! Of all the factors that influence the vegetation of Australia, fire is the most widespread and dramatic. The key aspects of fire intensity and fire interval have an enormous effect on the type of plant community that you will encounter in any particular place. 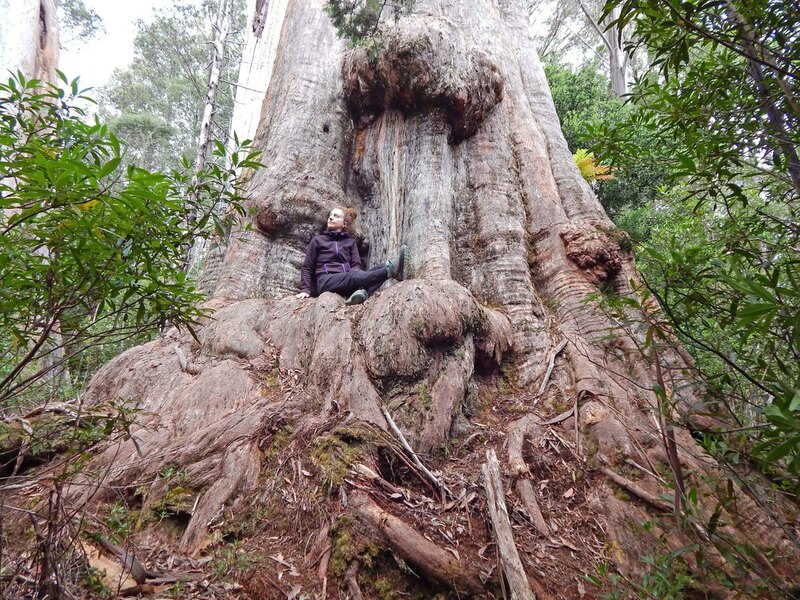 The giant eucalypts of Tasmania that I regularly profile on these pages only get so large because they germinated shortly after a fire that occurred over 500 years ago. 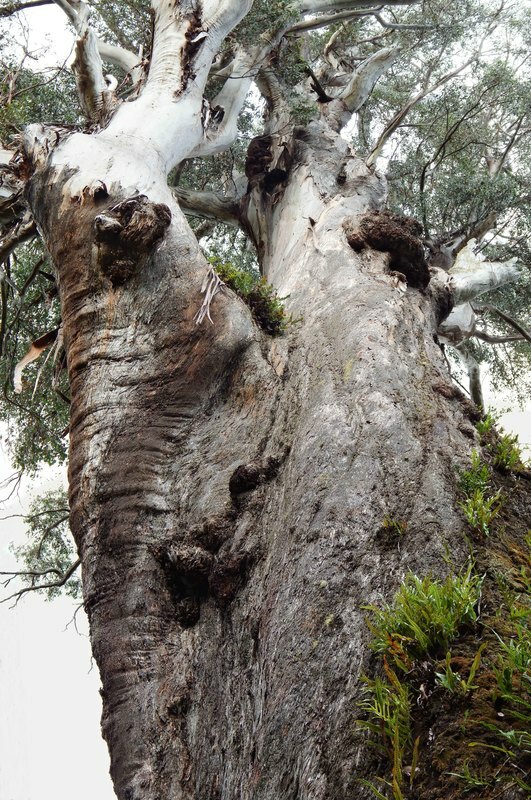 Furthermore, the reason why Victoria currently does not have any of the top 20 largest Eucalyptus regnans is not due to the lack of rainfall or appropriate aspects and soils. 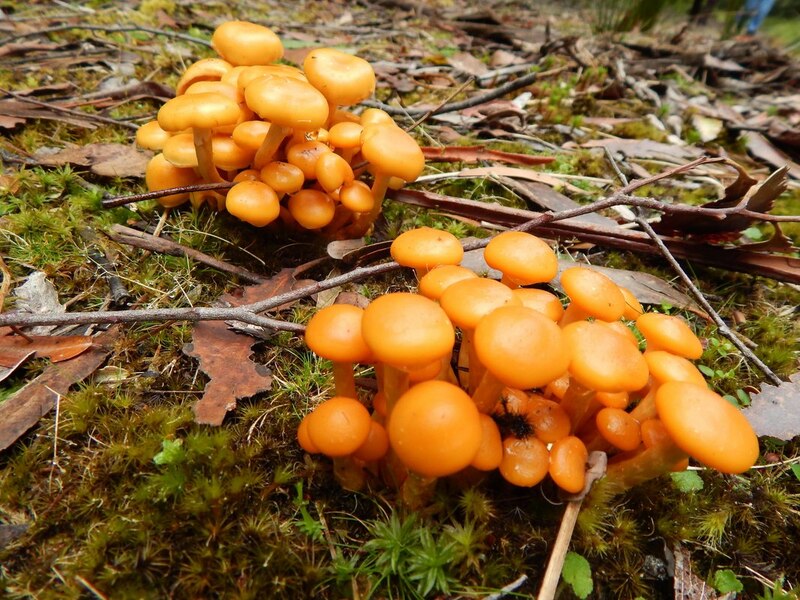 It is due to both the clearing of some of the best forests for agriculture in the late 1800s and the regular severe and widespread bushfires that have occurred since European settlement (1851, 1898, 1926, 1939, 1983, 2009). 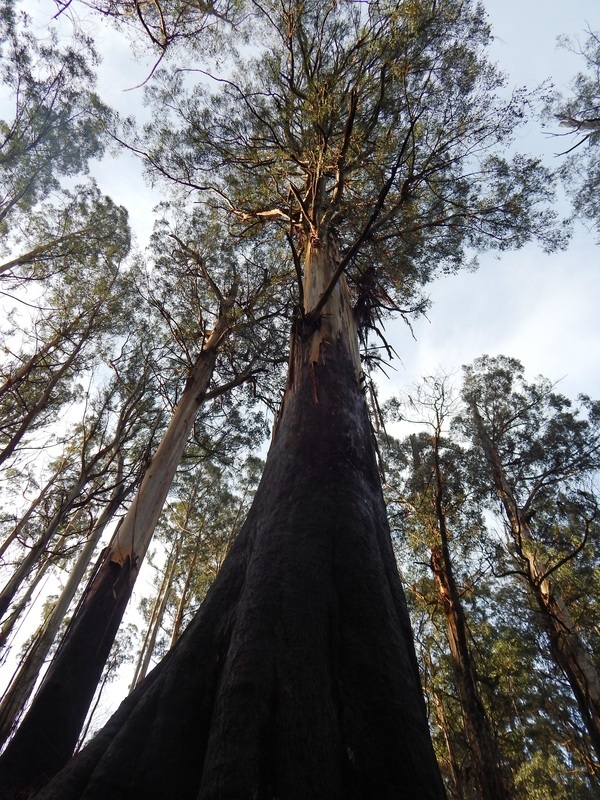 This has led to most of the Eucalyptus regnans stands remaining in Victoria being 80 years old or younger. That is why the trees profiled here are so special: In this land of fire they have defied the odds and lived for well over a thousand years. The first is a Huon Pine (Lagarostrobos franklinii) I’ve nicknamed ‘Venerable Vera’ (photographed above) as it literally grows out horizontally out into the lake that gives its name on the track to Frenchmans Cap in Tasmania’s Franklin-Gordon Wild Rivers NP. There has been plenty of fires in the area over the years: Indeed the historical log book in the Tahune Hut records a harrowing walk by a group of women in the 1930s where they noted that the method of track clearing in those days was to burn the scrub! One lady wrote that the flames that night on the ridges reached over 200 feet in height. 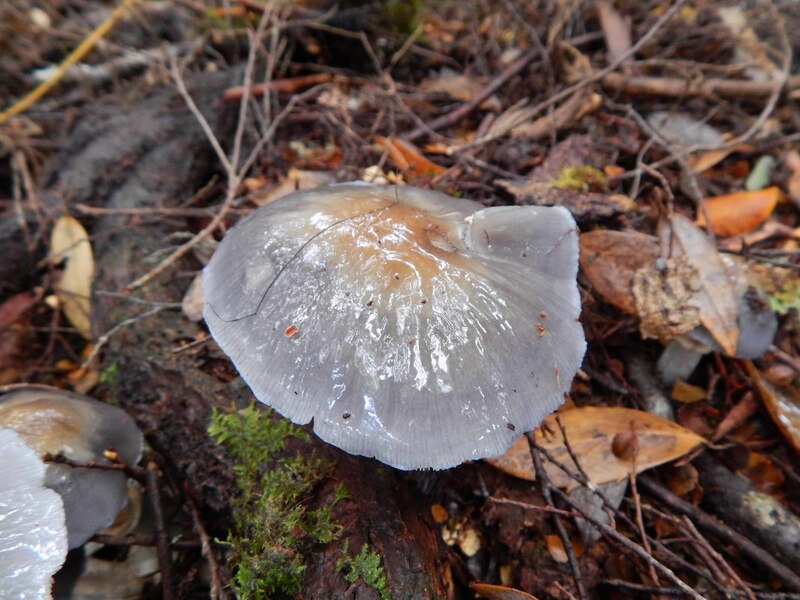 Luckily, ‘Venerable Vera’ and many other Huon pines escaped the flames in their protected niche by the lake side. 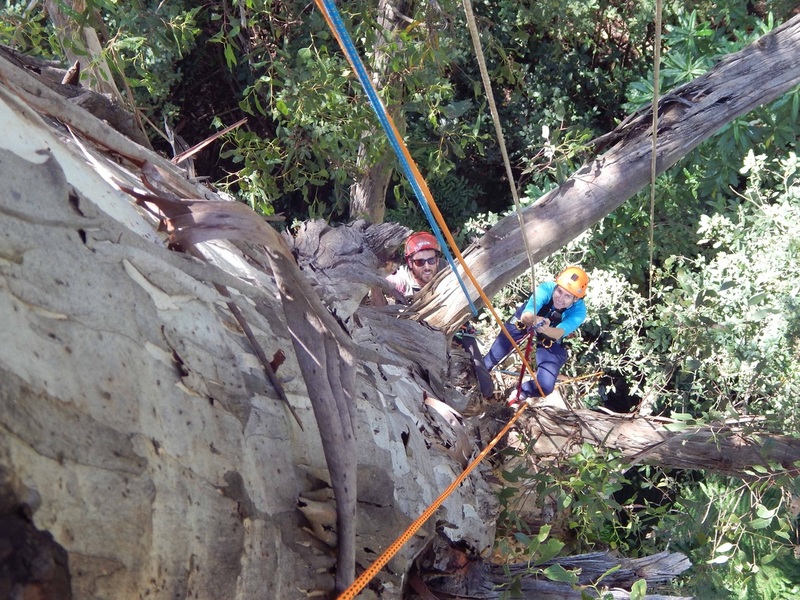 As seen by the photos, where the trunk of the tree leaves the rock is now hard to determine, however, the trunk is at least 1.5m in diameter before the bifurcation. 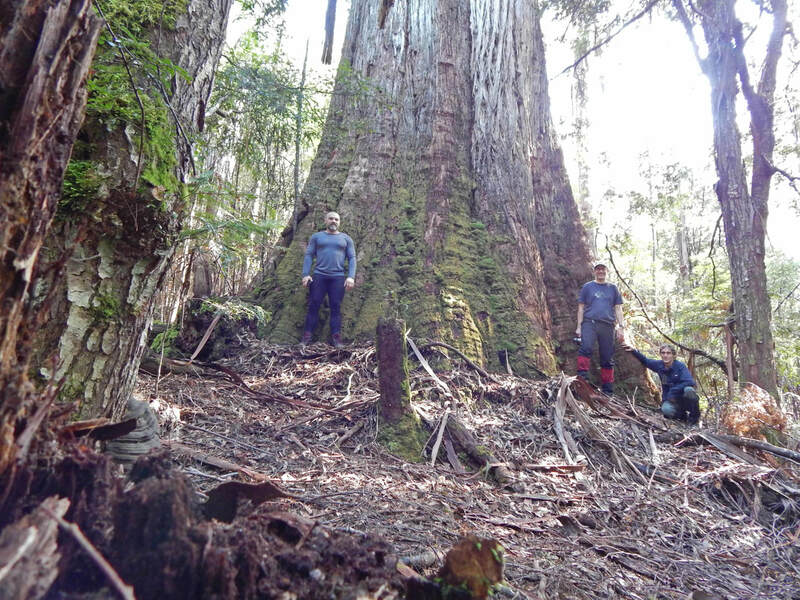 Given that the growth rate of a Huon pine is on average 1mm in diameter per year it is reasonable to think this tree is well into its second millennium. Above 'Penta-Pine', below 'Poppa-Pine', Dixons Kingdom, Walls of Jerusalem NP. 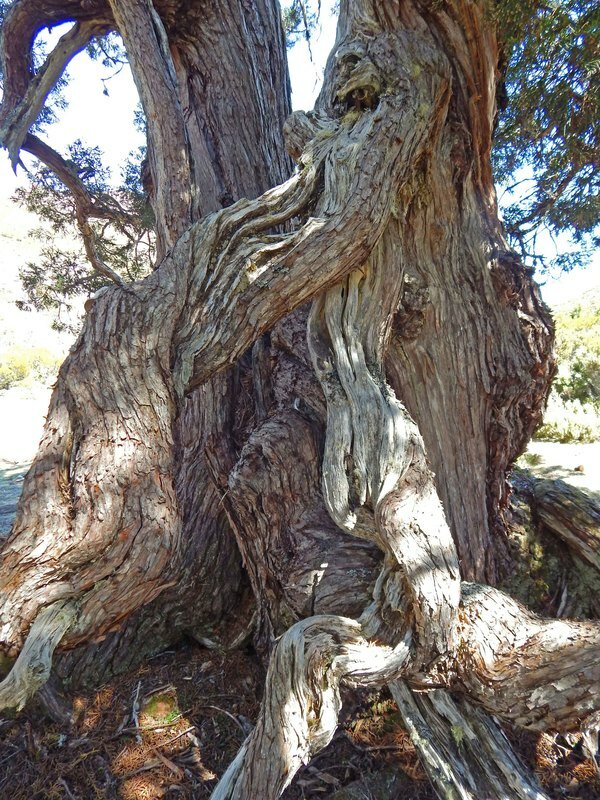 These are two of the largest single-trunked pencil pines in existence and would likely be well over 1000 years in age. 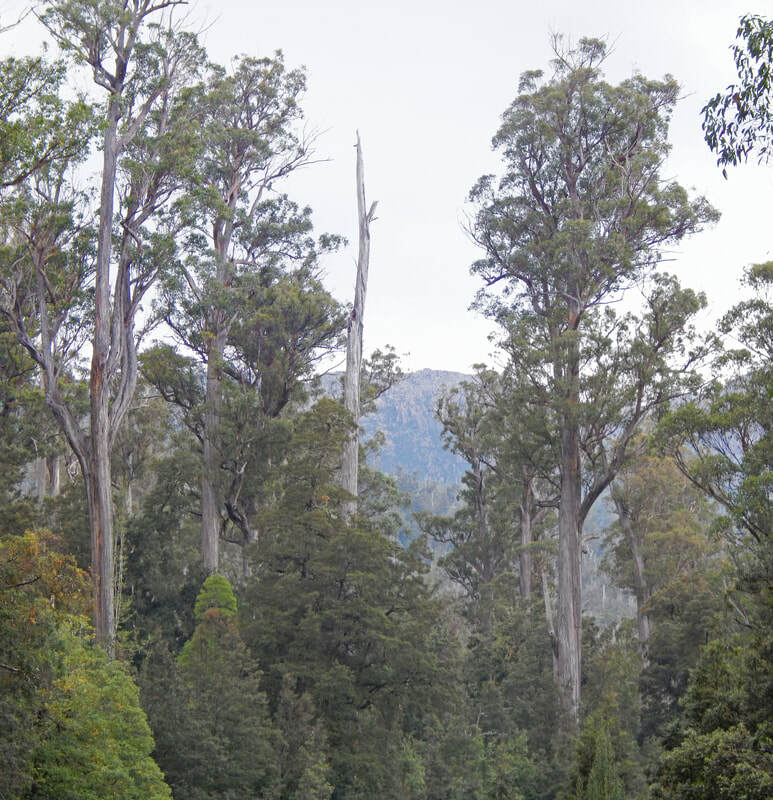 The next group of trees are Pencil Pines (Athrotaxis cupressiodes) and all are found within a forest known as Dixons Kingdom, located in the heart of the Walls of Jerusalem NP in Tasmania’s Central Plateau. At around 1250m in altitude, this area has severe winters – in fact bleak weather can occur here at any time of year. Nevertheless, the area still can have the occasional dry summer and the early cattlemen that would come up to the high country to graze their stock would often light fires to burn scrub. Some of these fires would get out of control and the skeletons of dead pencil pines seen for many kilometres across the central plateau are a stark reminder of the vulnerability of the pencil pine to fire. Dixons Kingdom not only contains the most extensive Pencil Pine stand I’ve seen, they also appear to be the largest, gnarliest and possibly oldest known. 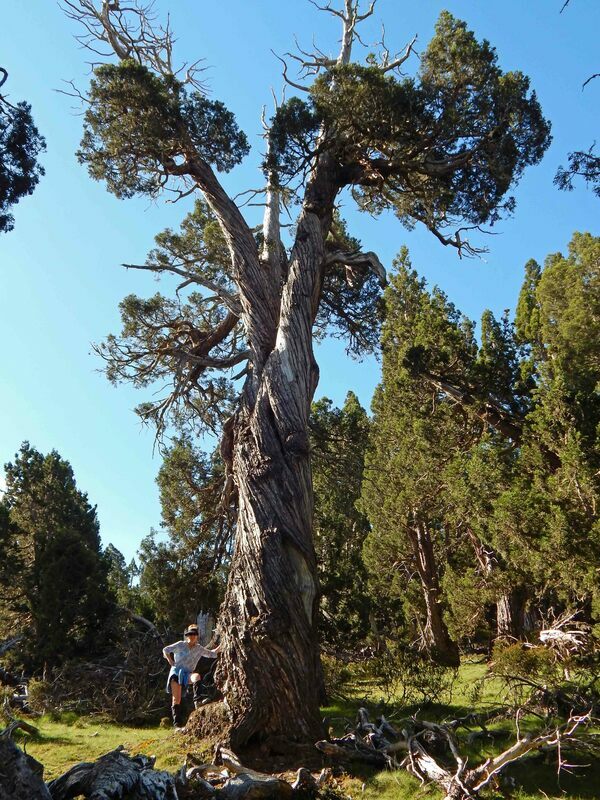 While the pencil pine does not reach the extreme age of the Huon pine, it still is a very slow growing tree and also known to exceed an age of 1200 years. Two views of the extraordinary 'Octopine' in Dixons Kingdom. This tree has over eight trunks growing at all angles from its base. I thought I'd found the gnarliest pencil pine in 2018. However, this tree easily takes that title. In Greek mythology, the Meliae were nymphs from the Mountain Ash trees - I know the trees growing in Victoria aren't exactly the European Mountain Ash that the myth refers to. However, I thought 'Meliades' was a suitable name for the amazing 1939 regrowth tree I lasered in early October. A week later on a beautiful spring day, Tom Greenwood and I climbed and measured it at 90.69m tall. The tree is a picture of health and vitality and is rocketing skyward. Below are some photos from the climb. Above and Below: Two views taken looking out from 'Meliades' from about 70m up. 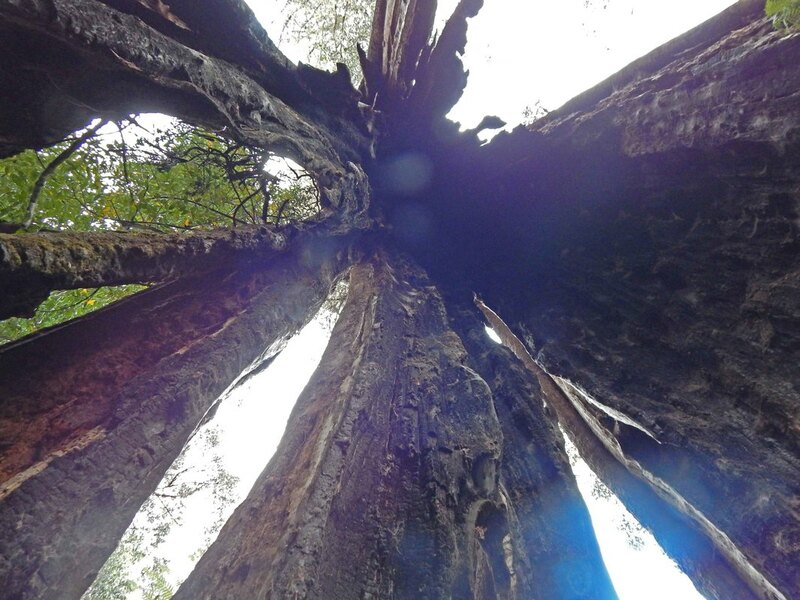 Looking up at the crown of the 90m tall 1939 regrowth tree. This is often the best place to laser a tall regrowth tree from, because you can often shoot right through to the highest leaves. Apologies for the bleakness of the photo, the day was very dull and grey. Firstly, some excellent news: The raised walkway at the Arve Giant has been fully rebuilt with steel after the original wooden version built in the late 1980s was deemed unsafe and removed about three years ago. The new walkway allows visitors to get an up-close look at this amazing tree. Although its top is long dead and breaking off bit by bit, it is still 85m tall. 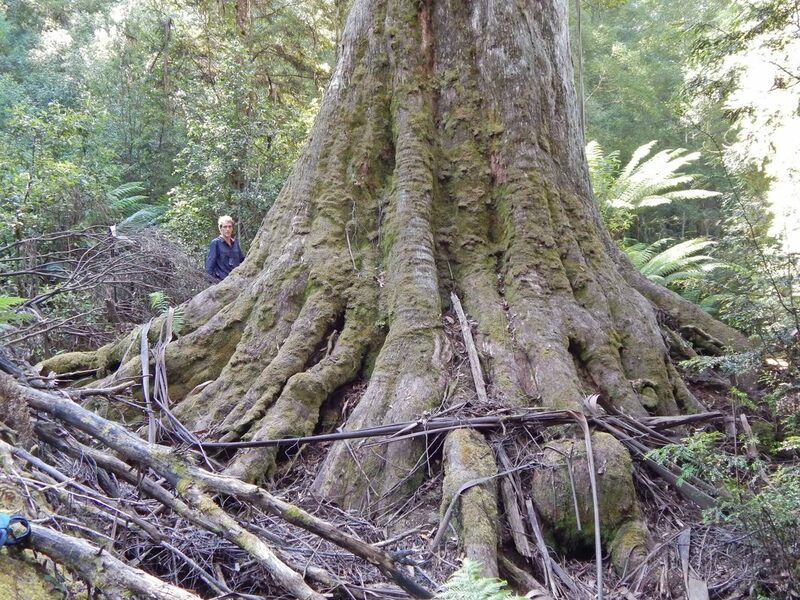 However, it is the Arve Giant's enormous trunk (photographed below) that makes this tree so impressive. Below: two views of the 'Four Horsemen' - I know, I know, you can only see 3 trees in either of the photos - unfortunately, the horizontal scrub (Anodopetalum biglandulosum) was so thick I couldn't get into a position where I could get all 4 trees into the shot! 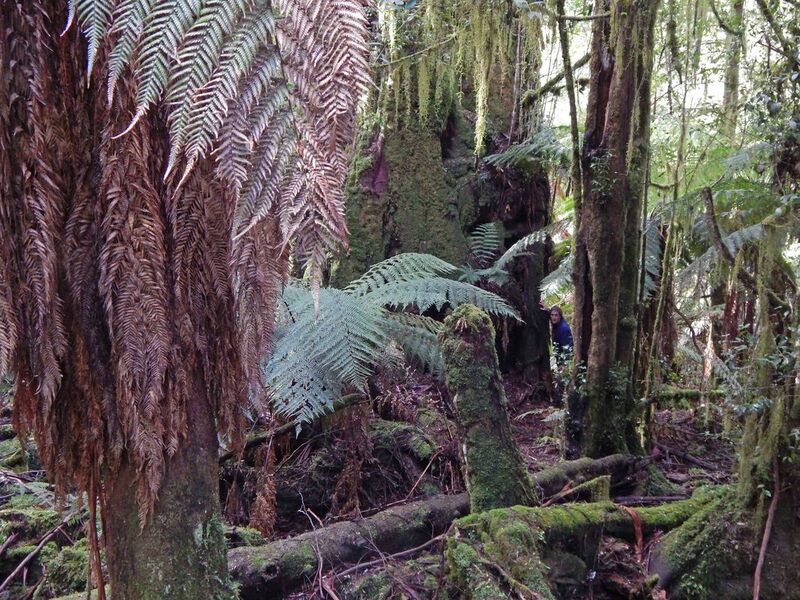 Old growth forests are often quite dark at the forest floor, with mosses and ferns creating a tapestry of brown and green as demonstrated in this photo of 'Leaning Lumpy Larry' a tree 15m in girth deep in the Arve Loop Forest Reserve. Growing nearby I also photographed the fungi below - often the only splashes of colour in this gloomy light are provided by the assorted fungi that are continually breaking down the organic matter. Victoria - back in the 90m+ club! Every now and then a discovery comes along that makes you rethink what is possible for a tree species: Following up some amazing LiDAR data kindly shared by Vicforests, I began lasering some of the targets in early August. 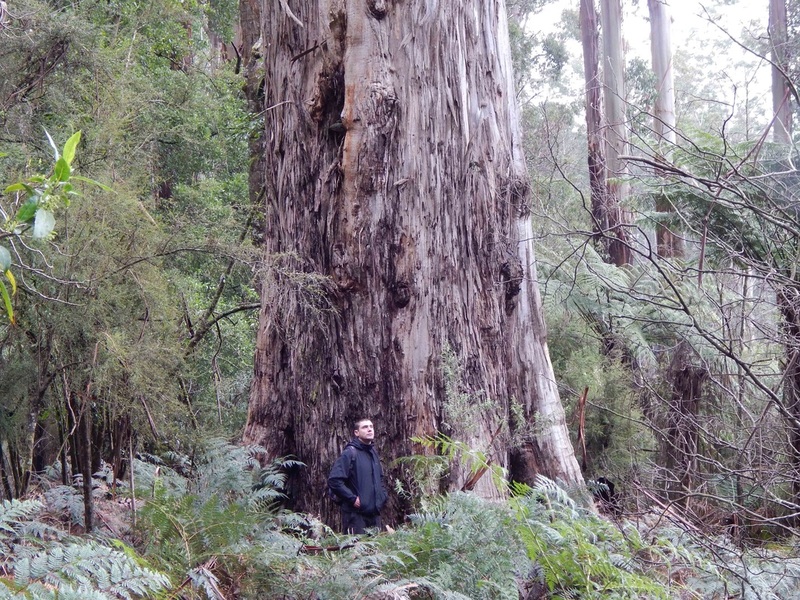 Today, September the 8th, Tom Greenwood and I measured one of these targets: a 1926 origin Eucalyptus regnans regrowth tree, located about 60km east of Melbourne. At first, Tom thought I'd played a trick on him by depositing the tape in the creek below to add a few meters to the tree's height - because the tape drop height came in at 92.1m! However, I assured him that the tape had come down on the high side of ground and the measurement was accurate. 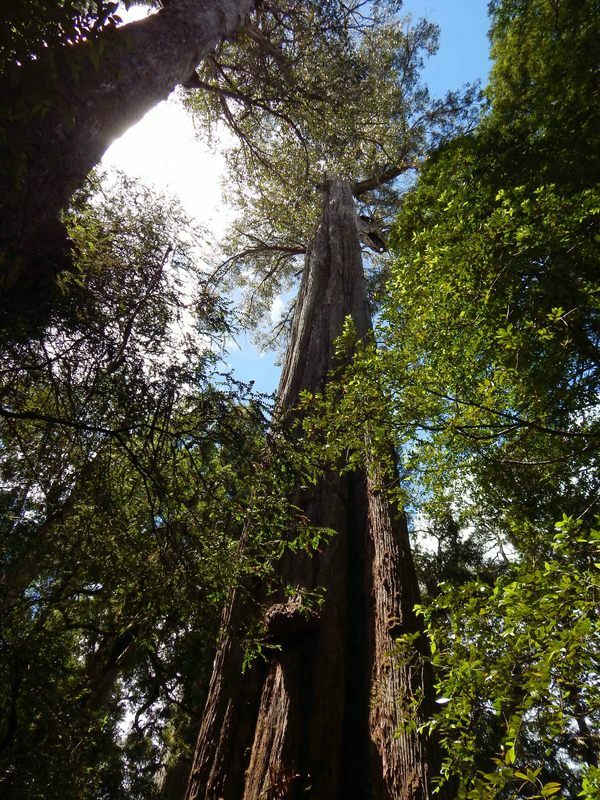 Not only does this discovery give Victoria a tree over 300 feet tall again*, it is the first known tree originating from the 20th century to reach 90m tall. This includes the entire planet, not just Australia! 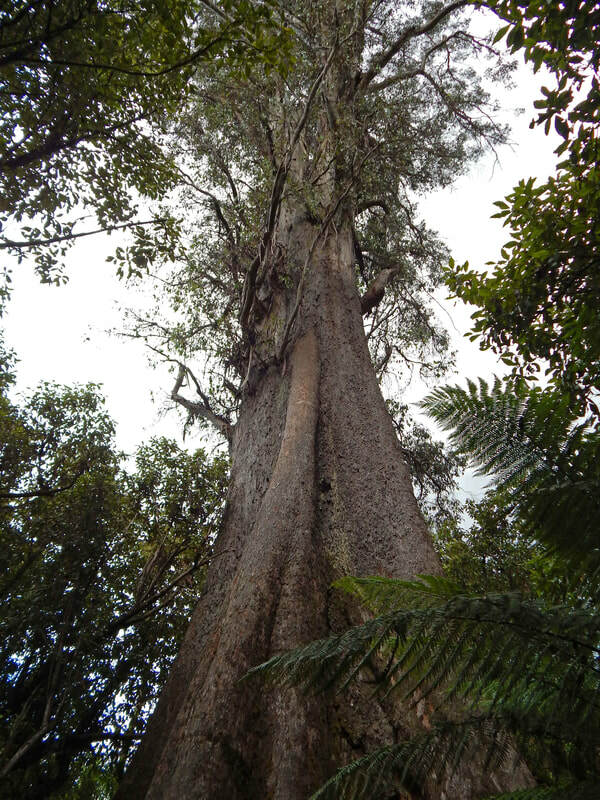 The tree is located in a sheltered gully and has a thriving, upwardly mobile and healthy crown. 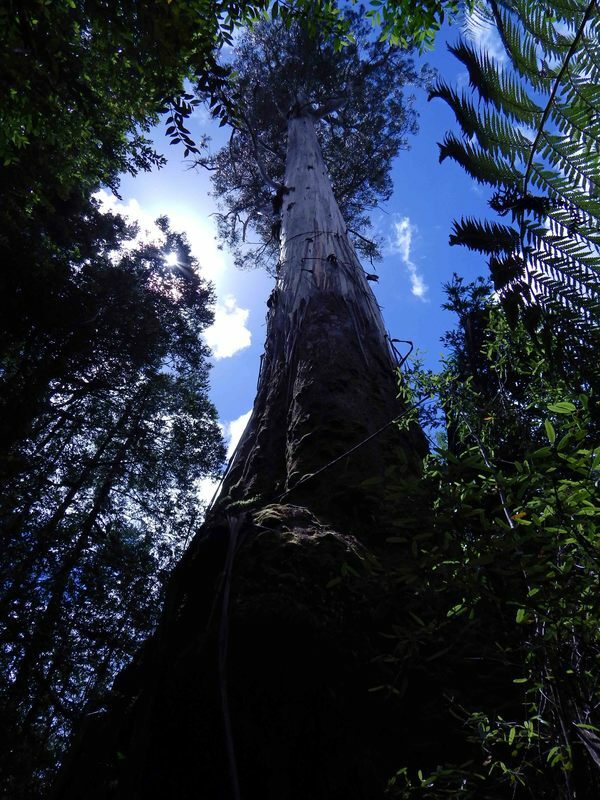 So far the tree has reached 92m tall in 92 years, and while it would be amazing if it could continue on that trajectory, our studies of nearby similar sized 1926 trees over the last 15 years indicate that its growth rate would now be slowing down. Nevertheless, hopefully this tree can escape the ravages of fire and windstorms for many more years yet and one day reach its full height potential. Below: Tom silhouetted in the tree on his descent. 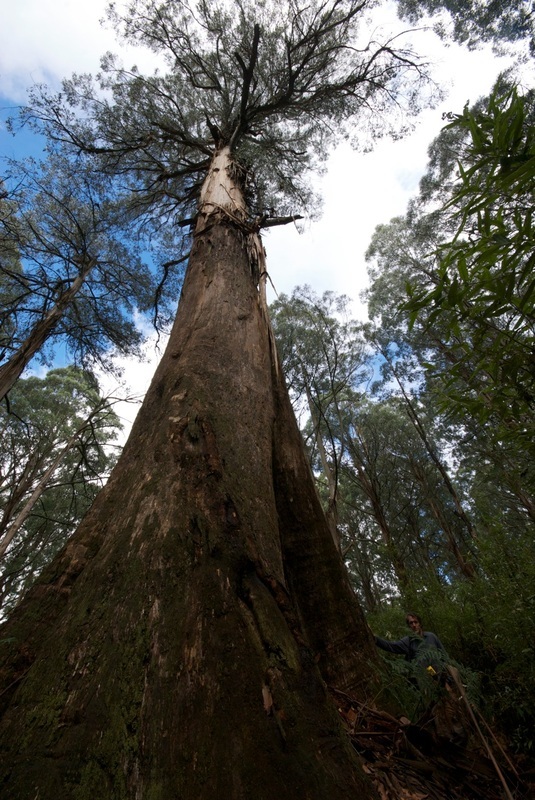 The Styx and Florentine Valleys have some truly immense eucalypts – rivalling in size those photographed in the late 1800s in the Strzelecki and Otway ranges in Victoria before those regions were ravaged by fire and clearing for agriculture. 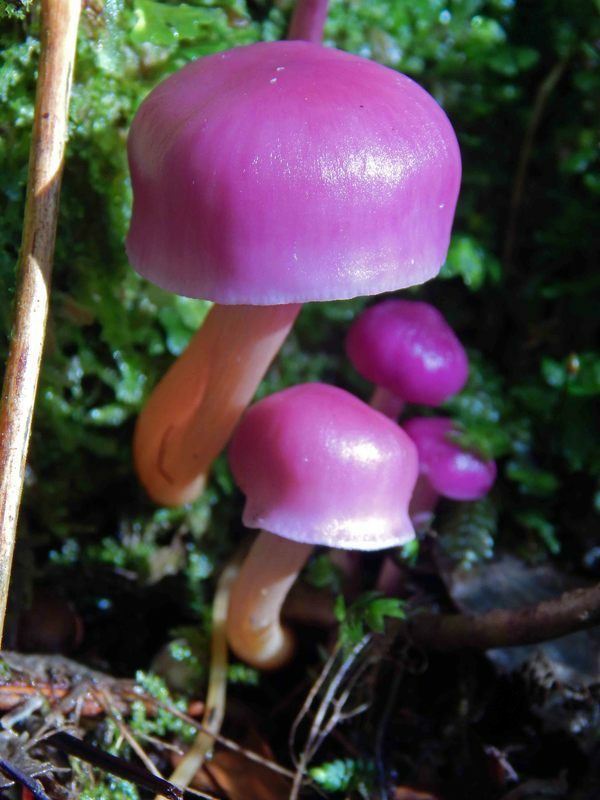 April is often a great time to visit them as the increased autumn dampness gives rise to a profusion of fungi that add colour to the forest floor. 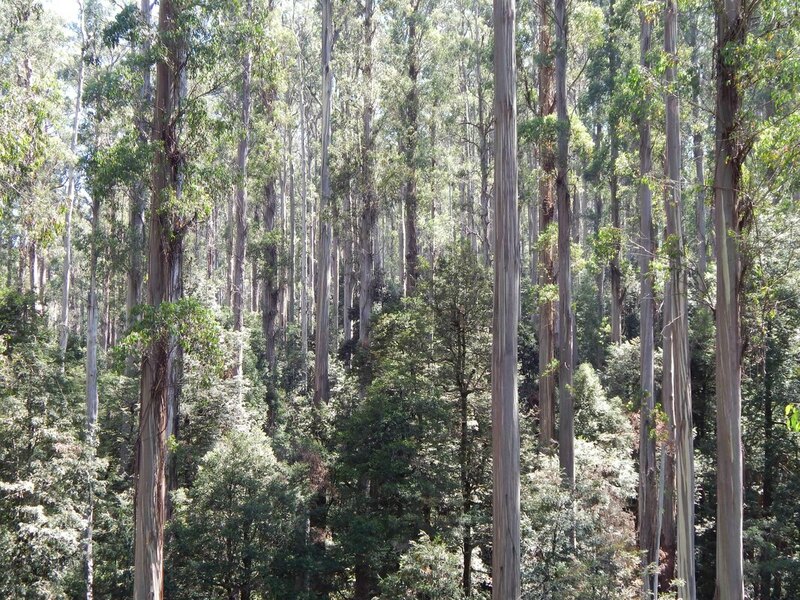 The Lady Binney Forest Reserve contains an impressive stand of Eucalyptus obliqua. While the entrance to the old walkway is now obscured and the signs removed, a short walking track still exists, is easy to follow and immerses the visitor in classic old growth forest. Sometimes when searching for giant trees, it is more about the journey than the destination. A perfect example was in early January 2018. While walking from the Gordon River road high up into the range behind Maydena, on the way towards some LiDAR targets, we spied some beastly old trees just off the track. We continued on to the LiDAR trees which turned out to be in the 86-87m range - they were tall but not overly large trees (see photo below) and then returned to put the tape around a few of the older trees lower down the slope. Largest in girth, coming in at an impressive 20.4m was 'All about That Base'. Then there was 'Hercules' at 16m girth with some of the largest stubby branches I've seen on an old regnans. Last of the photos is 'Wall-Lord' with its slow tapering, dark trunk. Above an 87m tall Eucalyptus regnans high up on the Maydena range - Even though it was late in the day and the light was poor, this was one of the few opportunities where we could capture an entire tall tree with a person for scale at the base. Above, the 20.4m girth 'All About That Base'. 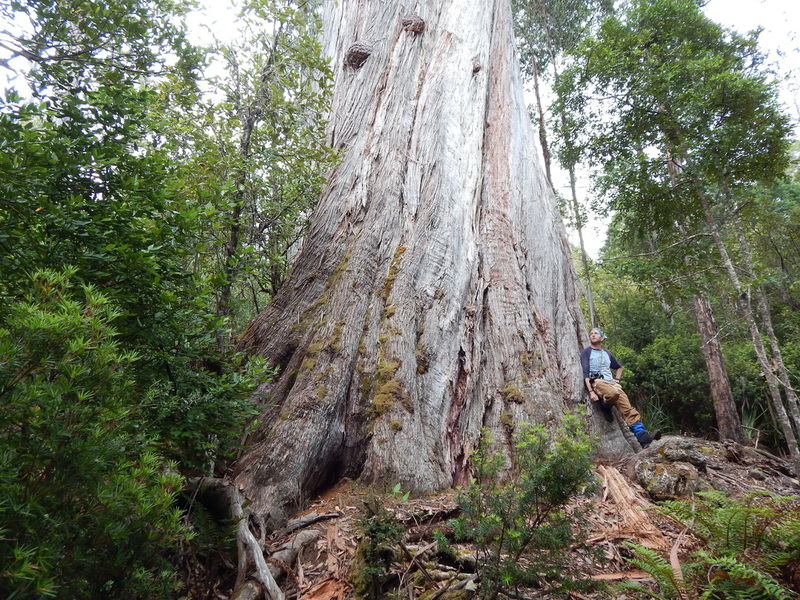 It is not often that a eucalypt exceeds 20m in girth at breast height, in fact I can only count four other living trees in Tasmania in that category so this was quite an exciting find! This tree is also remarkable for its lack of buttressing or fluting on its entire lower side (in the photo, the right hand side all the way around the back) - it was literally a sloping wall of wood. 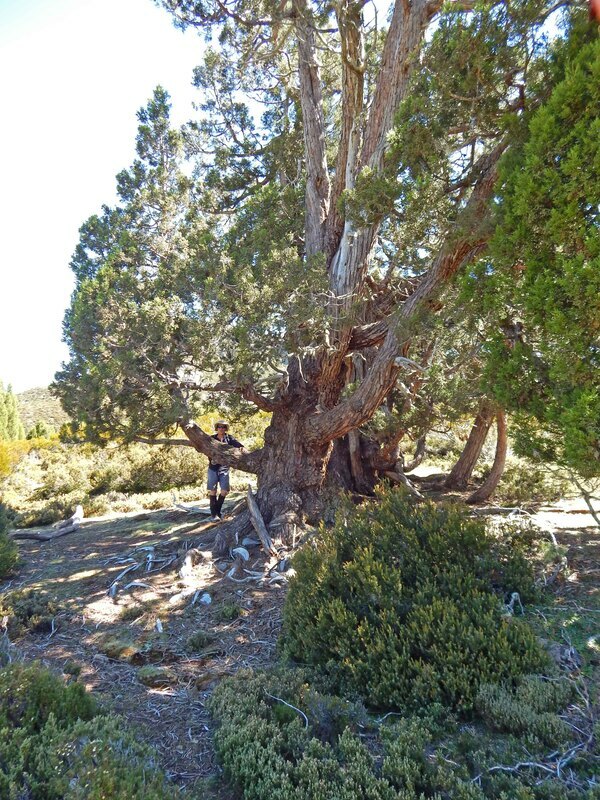 Above, the 16m girth 'Hercules' being obscured by a riot of mature musk (Olearia argophylla) This was probably the largest in overall volume of the trees we measured on the Maydena range. However, if the above picture does not do justice to the size of this tree, it was likely due to its base being one of the hardest to photograph I've encountered in a while. Above, retrieving the tape after measuring 'Wall-Lord', a slow tapering beast on the Maydena range. While stopping on the side of the Styx road to assess where to go into the forest for a LiDAR target, I spied the two beauties photographed below. Both of them are in the oldest age class for regnans - over 500 years old - and have seen and lived through storms, droughts, fires and logging and they certainly have the character to show for it. The 15.3m girth 'Gnarls Barkley' (I hope music fans get the reference!) - Again this tree's base was hard to photograph being completely surrounded by vegetation low down so I had to precariously balance on a small burl about 5m above the ground to get a sense of scale to the tree. At the risk of starting a debate, I'm nominating the two Pencil Pines, Athrotaxis cupressoides, pictured below, as the gnarliest I've seen. As seen below, one tree has low growing branches that have hit the ground and taken root to form new trees. Pencil pines grow very slowly, and these trees, growing at about 1250m above sea level in The Walls of Jerusalem NP, may exceed 1200 years in age. Above: Pencil Pines are limited to high altitudes, usually between 850m and 1250m a.s.l - but I have seen them growing close to the summit of King Davids Peak at over 1450m altitude. 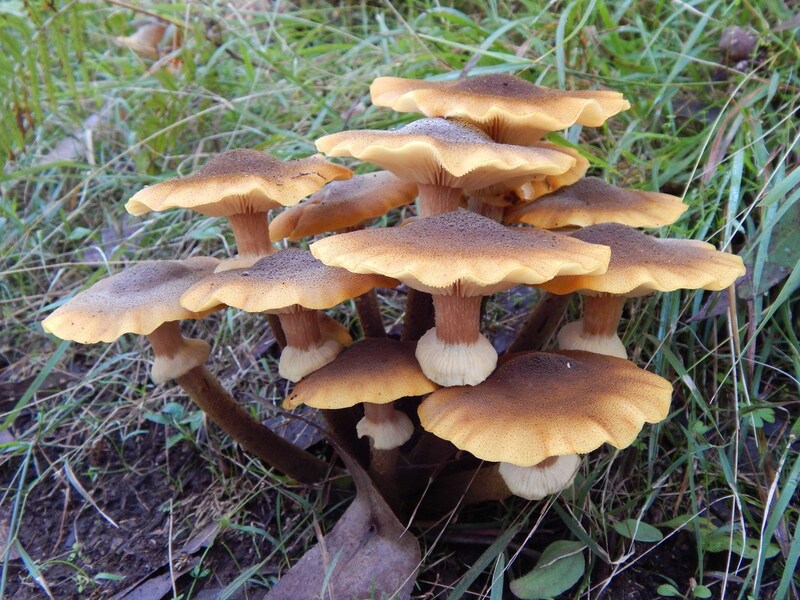 They like constant moisture and peaty soils and are often seen surrounding mountain lakes and creeks. Unfortunately they are extremely sensitive to fire and due to the severity and frequency of fire since European settlement, very few large stands remain. In fact in many areas of their former habitat you can see the white skeletons of Pencil Pine trunks extending for vast distances because the wood is very resistant to rot. Above is a photo of the largest remaining Pencil Pine forest, growing at Dixons Kingdom in the Walls of Jerusalem NP, taken from Damascus gate on the walk to King Davids Peak. 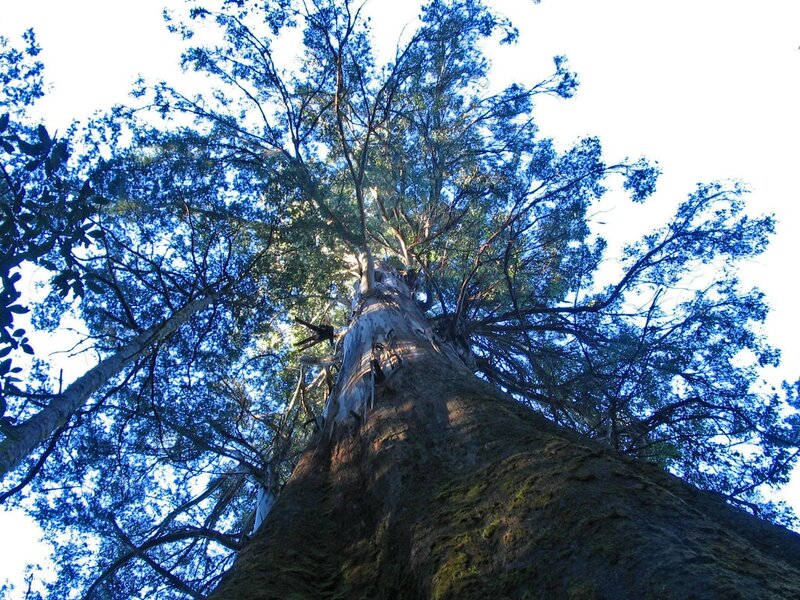 The Blue Tier Giant is a tree that oozes character. I measured it at 18.6m girth and around 56m to its dead top, however, mere figures do not do justice to this old survivor. The tree is so gnarly and irregular that I suspect there is not a single part of the trunk that is round. The buttresses rise to over 11m up and the trunk splits into two at around 16m. In the photo below you may be able to see the twin trunks, the left terminates dead at around 25m up so the major part of the crown consists of the right hand trunk. In early January 2018, we started walking to the tree in bright sunshine, however, a thunderstorm developed and we had to temporarily shelter in the dry part of the massive hollow to avoid the downpour. 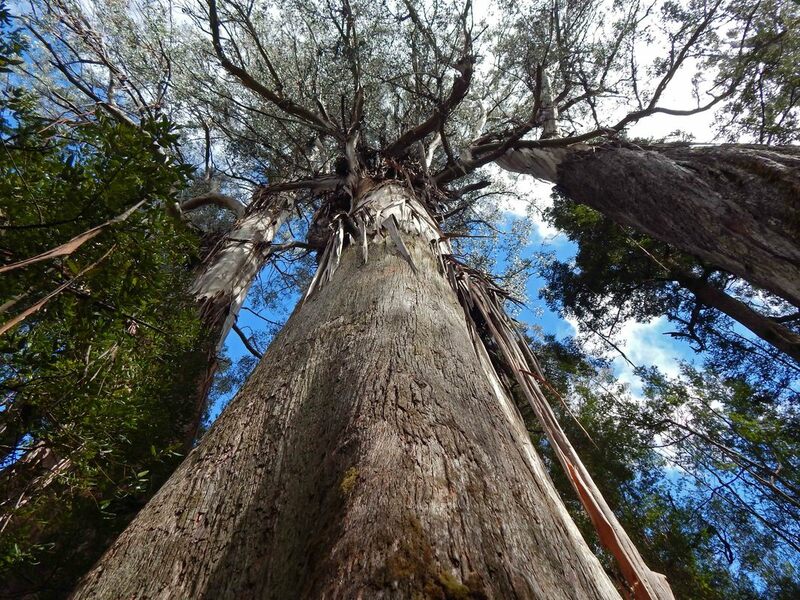 To visit the Blue Tier Giant, follow the sign north off Tasman Highway a few kilometers south east of the town of Weldborough in the North east of Tasmania. Follow this major forestry road for about 1 km just past a quarry, then a sign will lead you right, down on a lesser road - take it easy on this road, the track is overgrown on both sides, visibility is limited and there is room for only one vehicle. Also don't forget to write in the visitors book kept at the base of the tree. 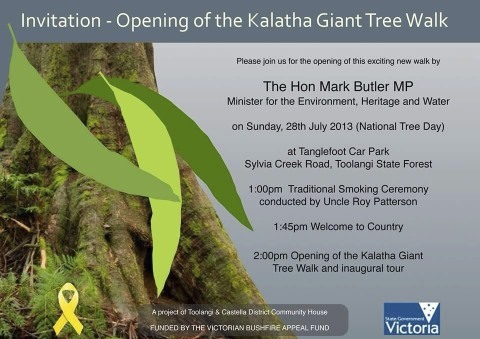 Congratulations to the Friends of the Blue Tier Giant who have put in so much work to both protect this tree and many others in the area and also for the fantastic walking track they have built to provide easy access to the tree. 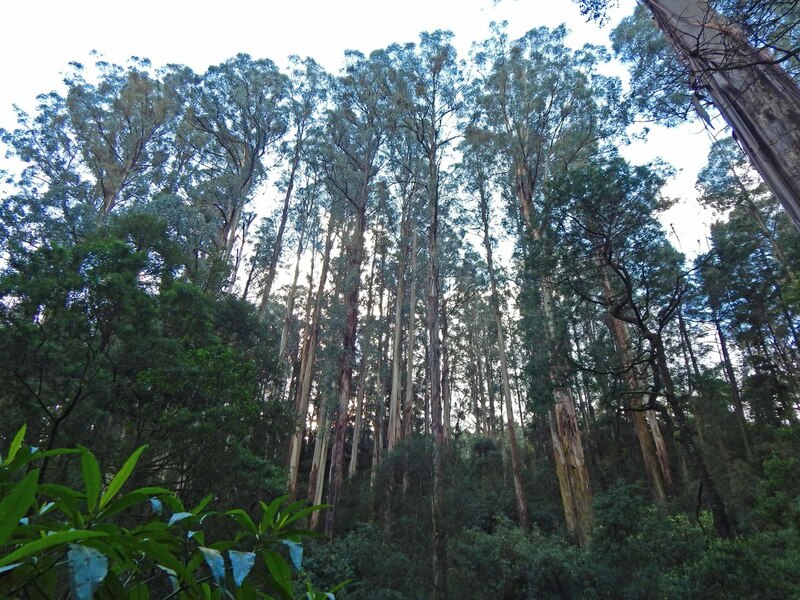 The recently expanded Gunyah Reserve in the Strzelecki Ranges has 'fingers' of undisturbed forest consisting of Myrtle Beech rainforest and ancient, wind blasted, Eucalyptus regnans trees. 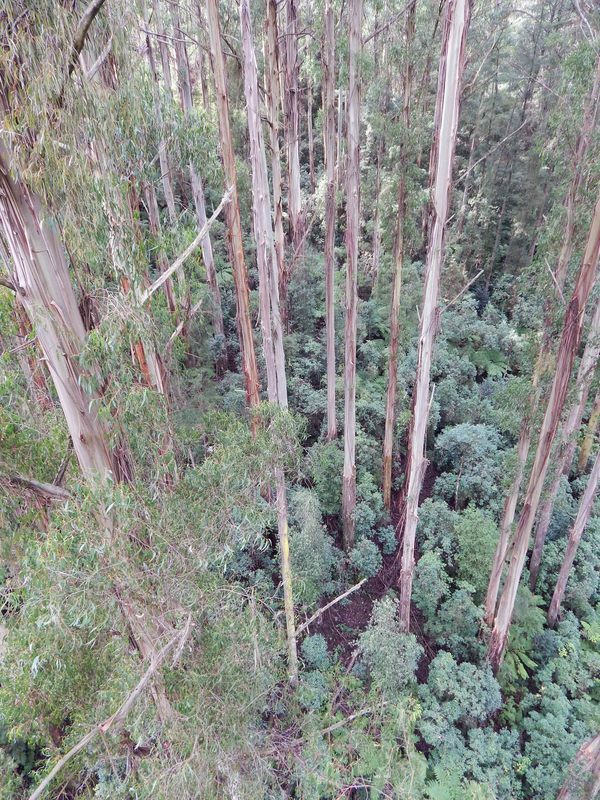 Once you are away from the gullies and creek lines, on the flatter ridgetops, most of the forest is regrowth Eucalyptus regnans, the result of logging operations by HPV over the last 20-40 years. This regrowth forest often has a thick tangled understorey of correa and wiregrass making progress on foot slow and difficult. 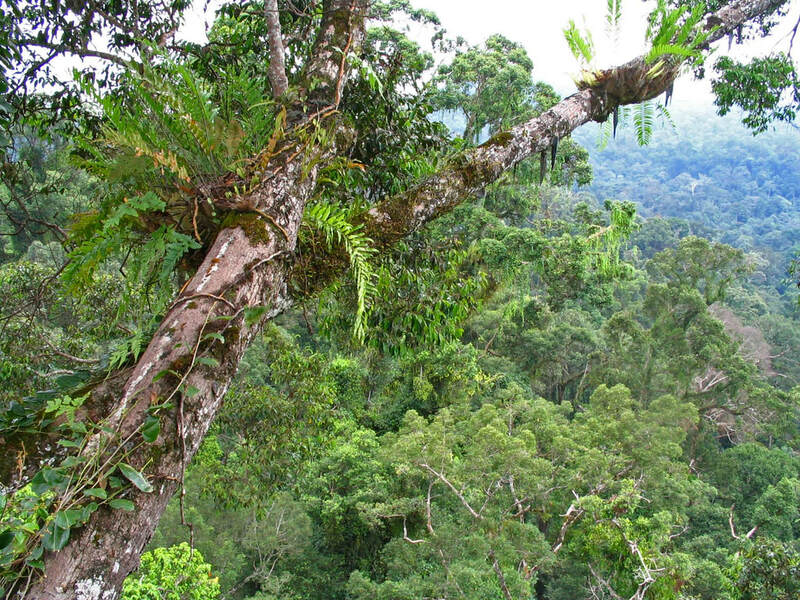 Nevertheless, as soon as you walk into the rainforest, progress is much more pleasant and you are transported to a relic of what these forests must have been like before European settlement. 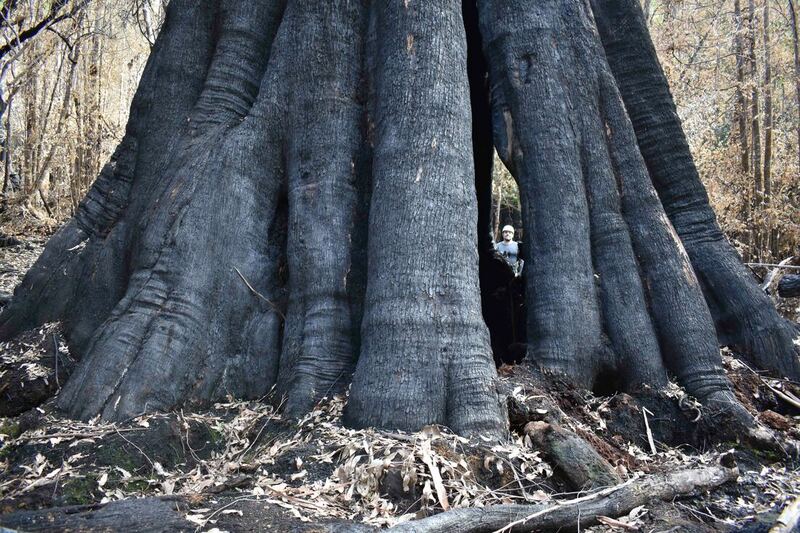 In late December in a six hour off track exploration focussing on the Upper Franklin river area we uncovered some impressive old beasts including the 13.8m girth 'Lone Star' (pictured below) and other trees 12.3m and 11.2m girth. 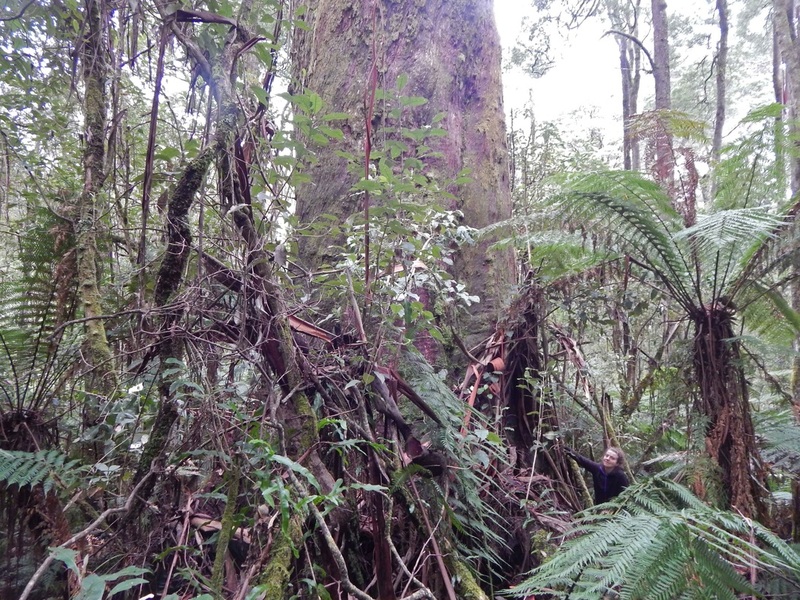 The 'Lone Star' tree was unusual in that it was completely surrounded by myrtle beech rainforest, with its closest eucalypt neighbour at least 70m away - most of the big old trees in this area are in clusters above the rainforest gullies. In our travels we also came across a little waterfall (below) which gives you some idea of the pristine nature of the area. Above and below - two views of Tom with the 'Lone Star'. 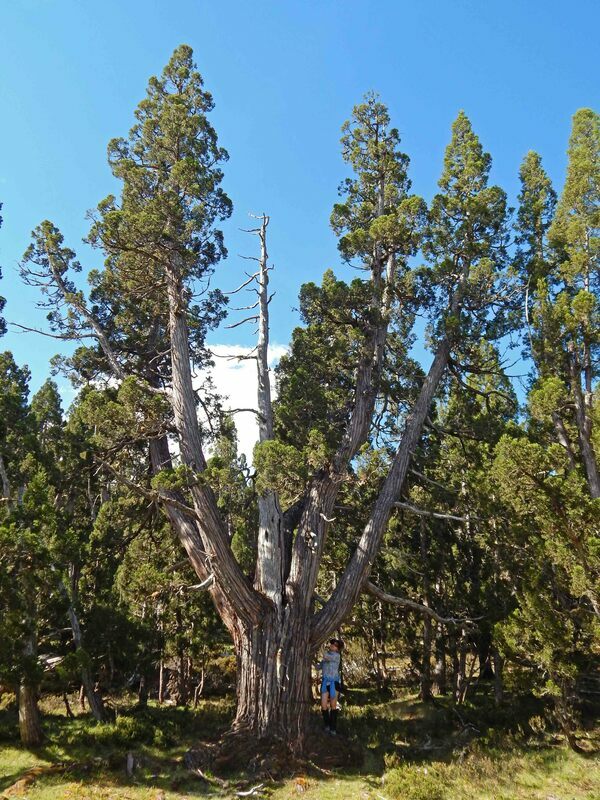 With its slow tapering, stove pipe like trunk, 'Lone Star' is likely the 2nd largest tree known by wood volume in the Strzeleckis behind the 'Mt Fatigue Giant'. 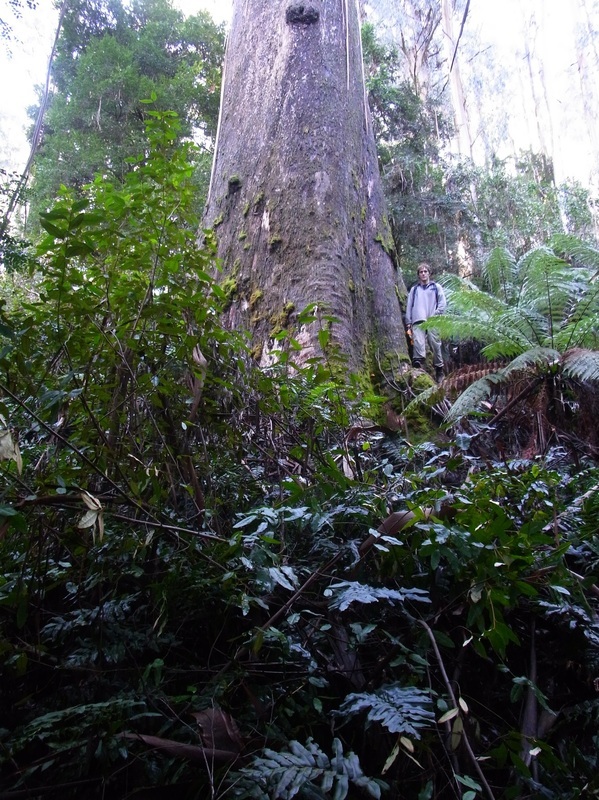 The tree is only around 50m tall, however, the main trunk is still thick where it is broken at around 45m up. 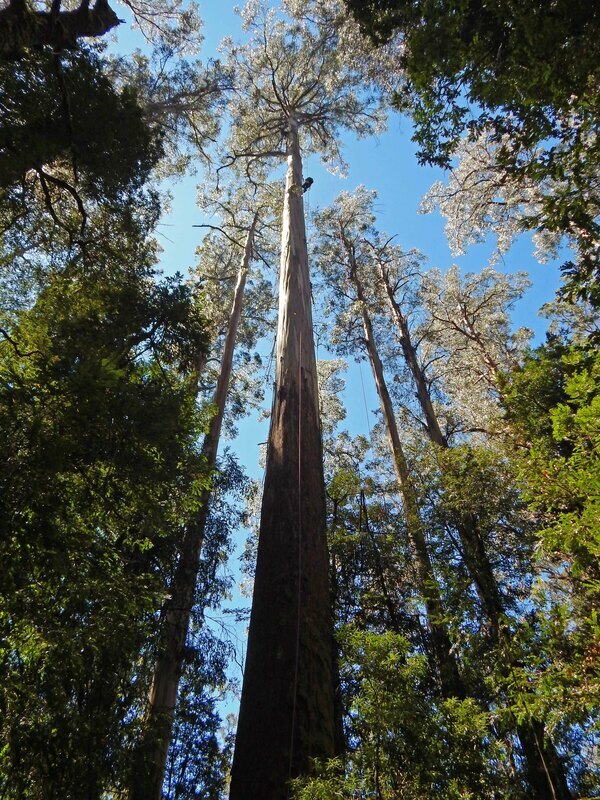 July 2017 update: Tom Greenwood and I measured the tallest tree in the upper Emerald Creek stand on a cold Sunday in mid July. 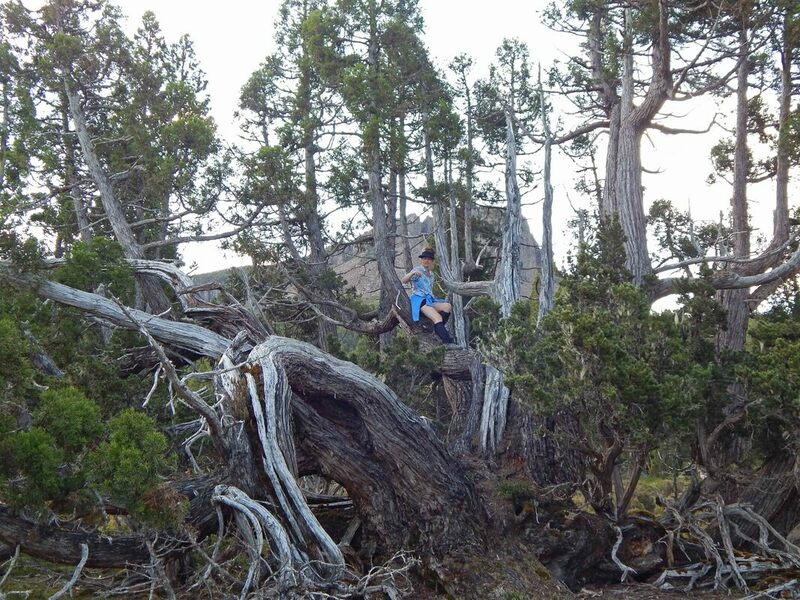 When Tom climbed to the top and lowered the tape, the tree came in at an impressive height of 85.2m tall. From his vantage point in an upper branch he was also able to easily laser the tops of the closest neighbouring trees and by carefully surveying the bases of these trees from the measuring tree we were able to obtain very accurate figures for them. They came in at 83.3, 82 and 81.4m tall respectively - which indicates that this tiny stand may in fact have more than a dozen trees over 80m in height, exceeding my previous estimate. 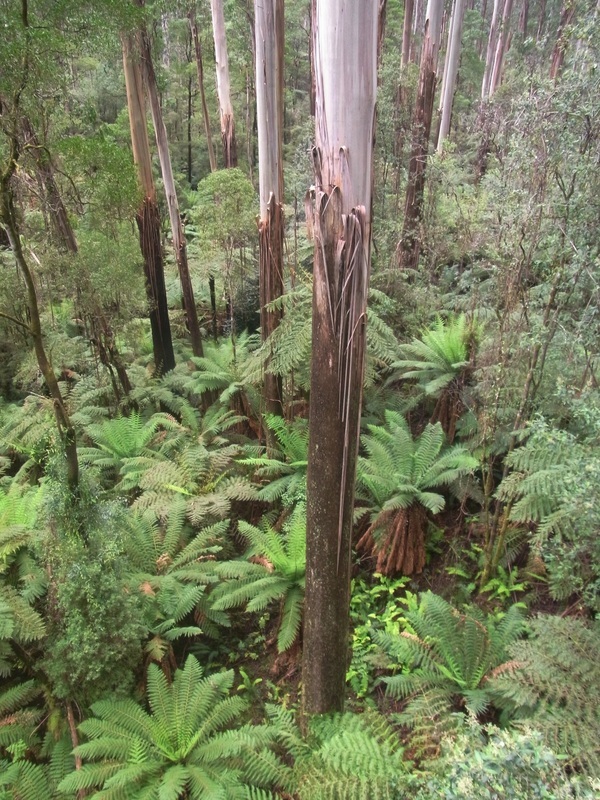 June 2017: In the headwaters of Emerald Creek there is a small but very impressive patch of tall regrowth Eucalyptus regnans growing on a steep, south facing slope. 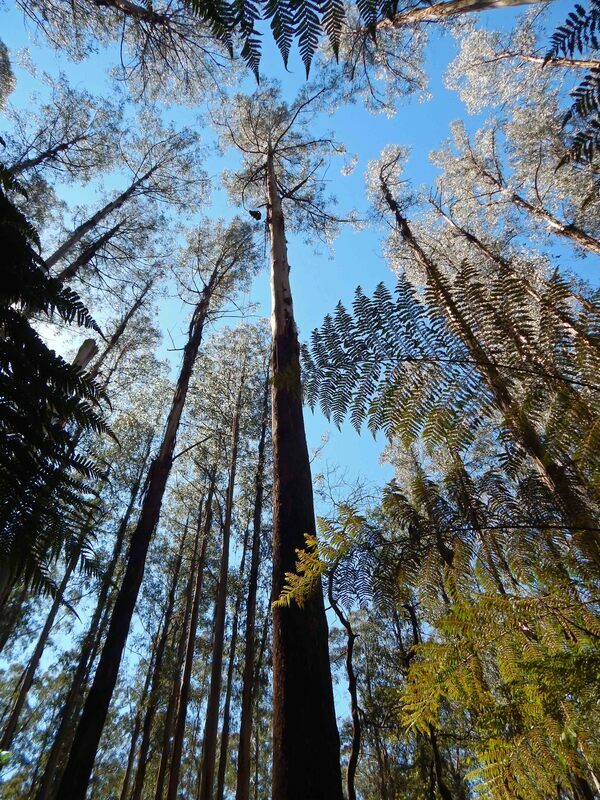 The stand probably originated in one of the numerous Dandenong Ranges fires of the 1920s and is bordered by an overgrown and likely abandoned Pinus radiata plantation. While the stand is tiny - only about 100m x 50m in size - I recently lasered at least 10 trees within it that exceeded 80m in height, with the tallest being about 84m. Many thanks to Jeff Latter, who is part of the Yellingbo Conservation Area Co-ordinating Committee for directing me to the area. I know this site is normally reserved for tall and giant Eucalypts, however, I couldn't let the opportunity of showcasing this old relic slip by. While bushwalking along Bluff track in Victoria's High Country between Mt Magdela and The Bluff at around 1600m in altitude, we came across this amazing snow gum Eucalyptus pauciflora subsp niphophila. 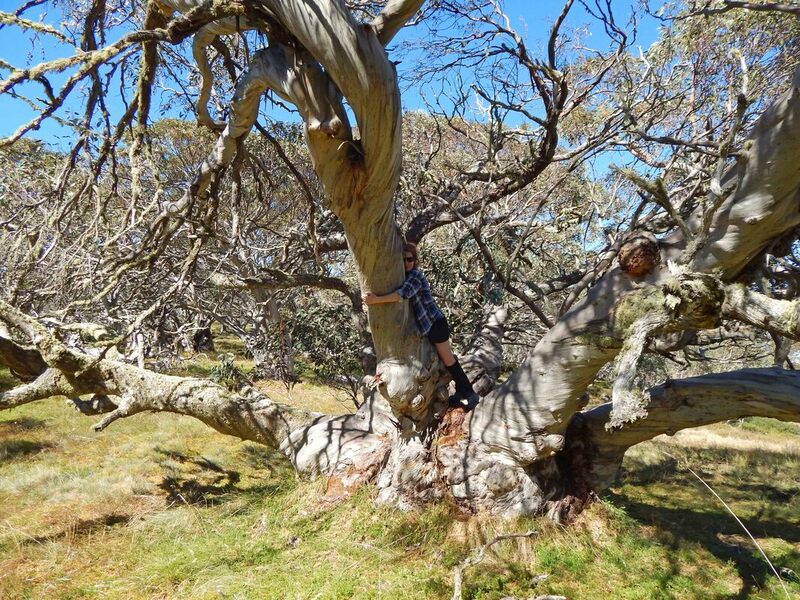 It is perhaps the gnarliest snow gum I've ever seen in many a trip to the area - It has been named the 'King Billy Tree' and has Heritage listing on Victoria's National Trust register. Having no laser or tape measure with me, I didn't obtain any girth or height statistics - but the National Trust lists it at 9.4m girth and a wind restricted 6.7m tall! Snow gums at this altitude grow very slowly and are often covered in snow for 3-4 months of the year. They are also subject to extreme winds and bushfires. Miraculously, this locality had somehow missed the serious bushfires in 2003 and 2007 that burnt tens of thousands of hectares of alpine snow gum country. 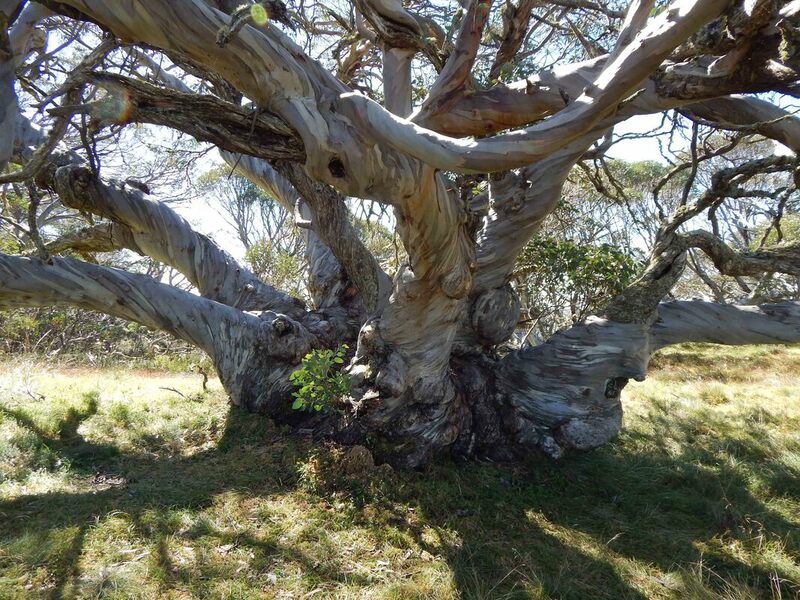 Nevertheless this tree appeared centuries older than all its nearby unburnt mature companions and all the other snow gums we saw over the three days of hiking. Autumn is an ideal time to visit Tasmania's tall forests with often stable weather patterns that include cool nights, crisp mornings, calm days and excellent light for photos. So I took the opportunity to team up with some old friends to check out some special trees and also follow up on some potential tall trees identified by LiDAR. 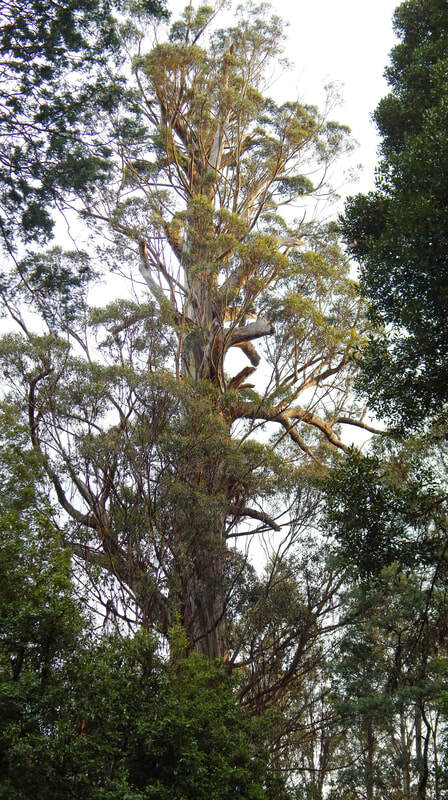 The 88m tall 'Furry Flo' with its long stocking of rough bark. 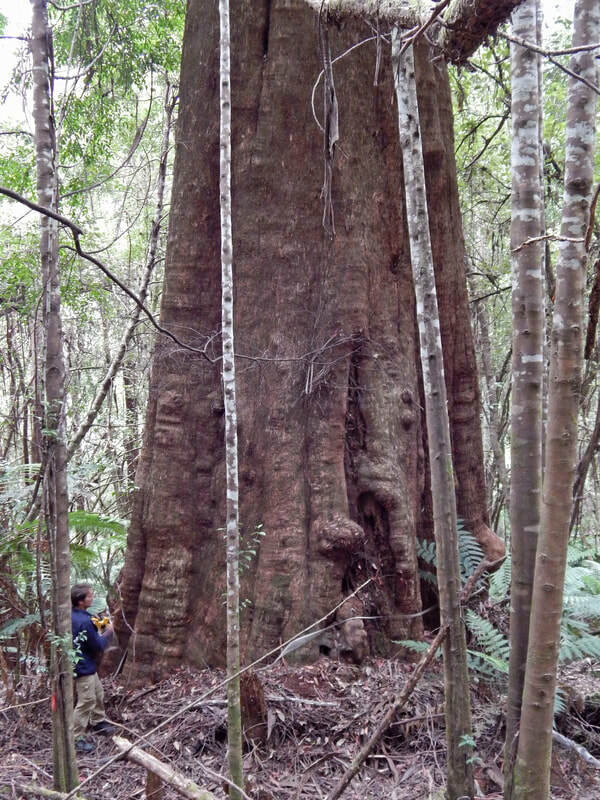 This tree is in a remote part of the Wayatinah area, accessed through pure rainforest of sassafras and myrtle and may never have seen a human visitor before. Above - when looking for a potential tall tree identified by LiDAR, a giant tree had collapsed across Harveys Creek allowing us to cross easily - when looking back to photograph the crew crossing the creek I noticed just how big the tree I'd ambled past was! 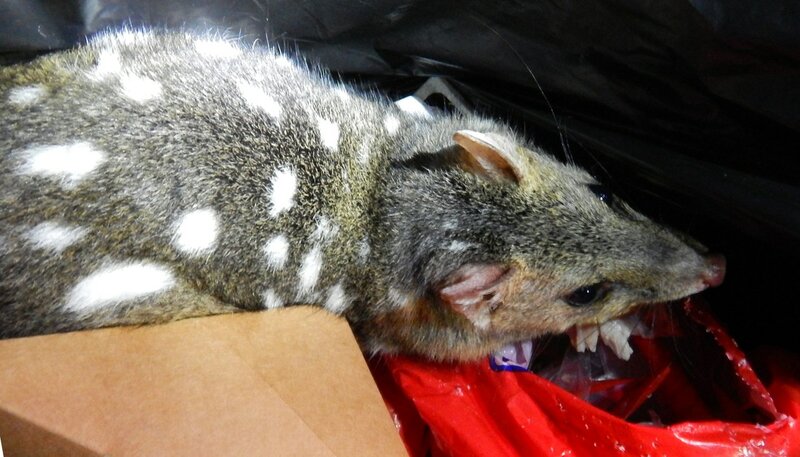 An unexpected surprise greeted us when we opened the bin at the Arve River Camping ground: a spotted quoll snacking on discarded chicken! Above and below: The remarkable 'Stilt Tree' - how this giant leaning monster is still upright is anyone's guess with probably 200 tonnes of wood being supported by a few remaining living shafts of wood. When walking up Heald Spur in January 2017 I noticed from afar that the familiar crown of the Wayatinah Giant was missing from the skyline. This tree had been severely damaged by a fire in 2010. (for comparative photos see http://tasmaniasgianttrees.weebly.com/florentine-and-upper-derwent.html ) Although growing 50m above the road, it had collapsed and tumbled a little way downhill before falling and the top section had shattered, completely obliterating a section of the regrowth below the road and 80m from the tree base. 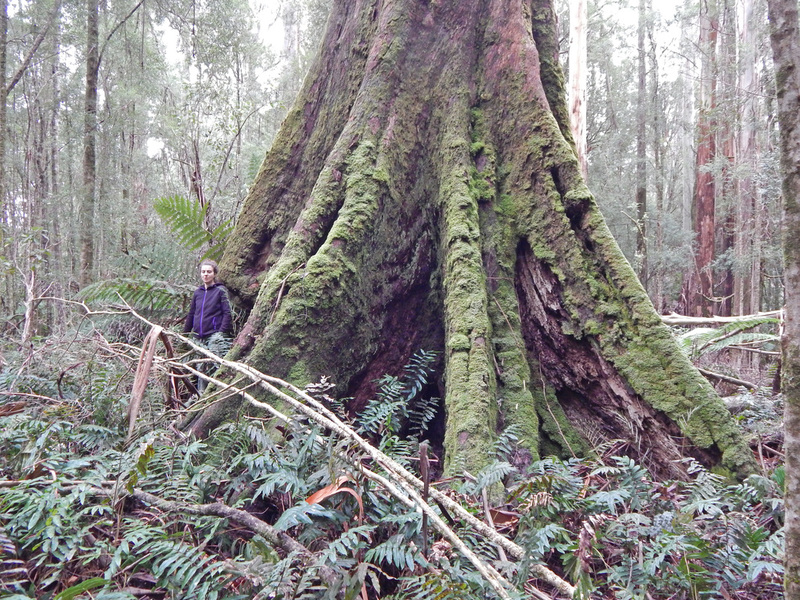 This tree was pretty special to me as it was the first truly giant tree I found in Tasmania in 1992. 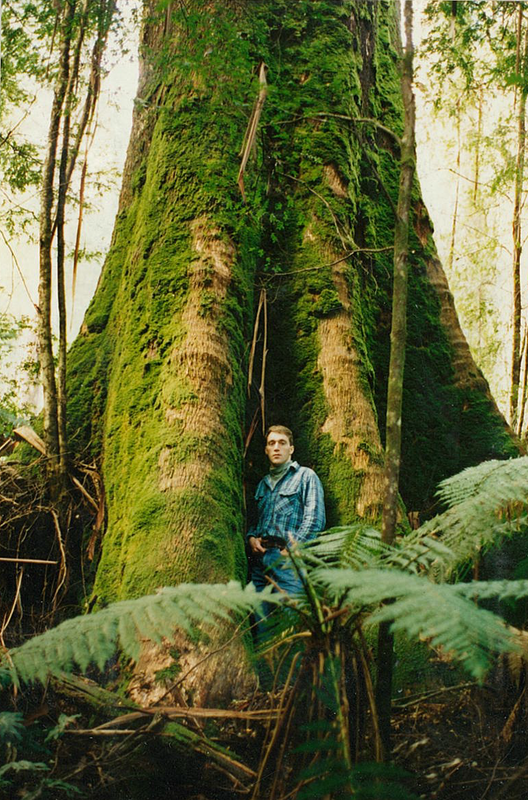 It was 17.4m in girth and was 85m tall - it's trunk remained massive for a long way up, with the tree having the largest diameter for a living eucalypt at the 45-50m height range where it was still 6m in girth. In January 2017 a number of amazing trees were uncovered when searching through a few areas where there had been LiDAR hits above 85m. 'Countess Basie' is over 16m girth and is very photogenic having an unusually clear view to its base. 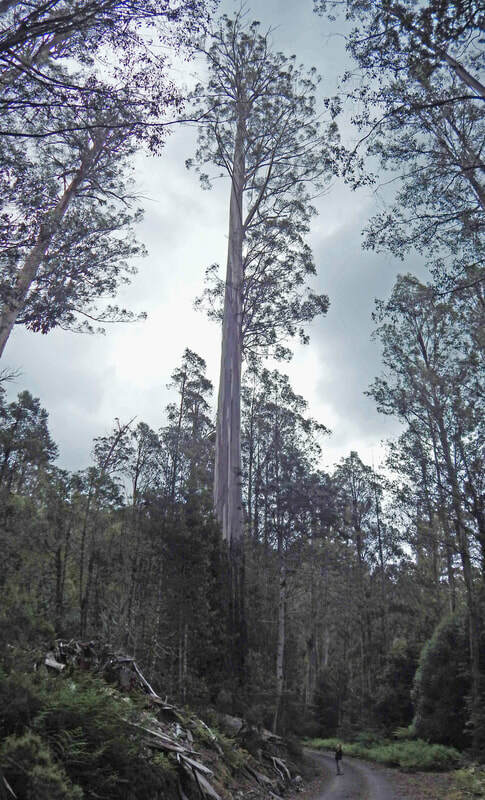 'Brutus Maximus' is an 86m tall Eucalyptus regnans and while it has a large, rather than 'giant' girth of 13.8m, it still may push 280m³ in volume due to its huge, slow tapering trunk. 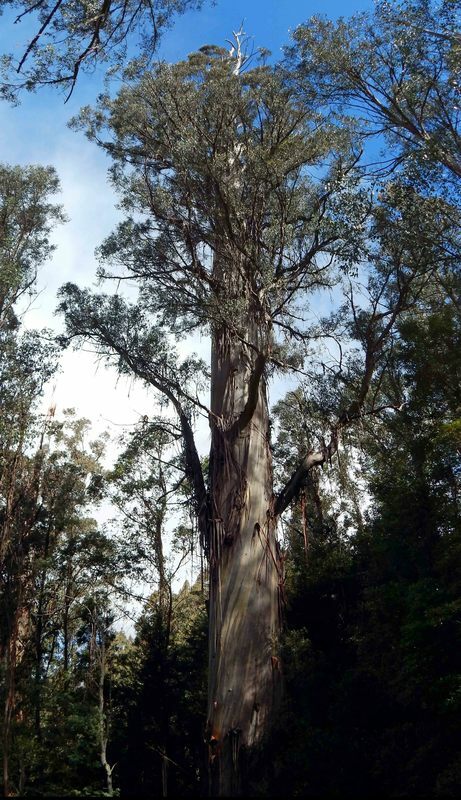 'Shield Maiden' at 17.4m girth and 87m tall is a show stopping, classic 500 year old Eucalyptus regnans, clean of branches for a considerable way up on its southern side. 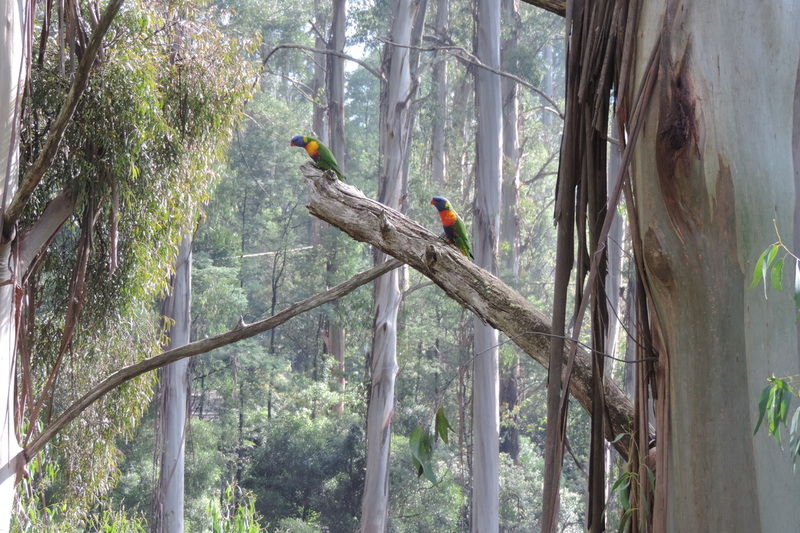 However, these trees were almost upstaged by a pair of ancient Eucalyptus obliqua trees growing 30m apart. 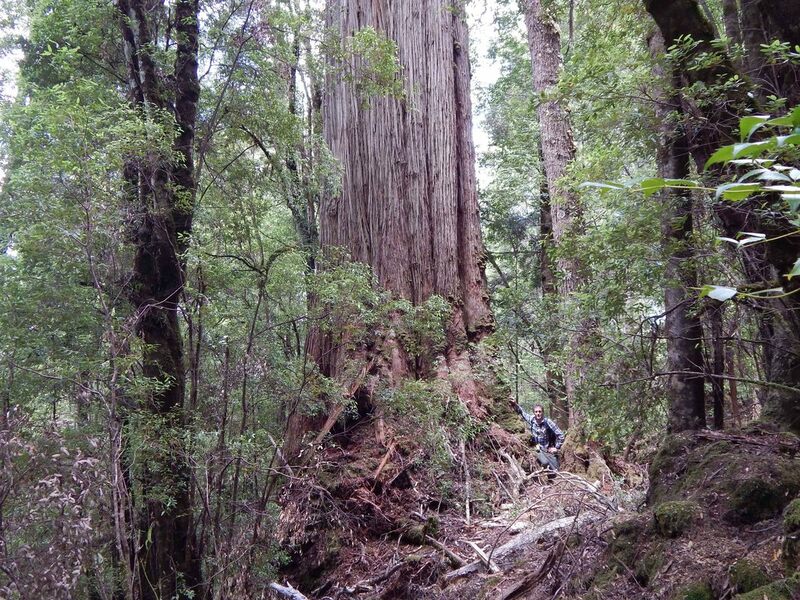 'Obnificent' has a redwood like lower trunk and is 14.8m girth and around 77m tall. Its neighbour 'Obli-Wan Kenobi' has a slightly larger girth at 15.8 and an amazing gnarly fluted trunk and complex crown. 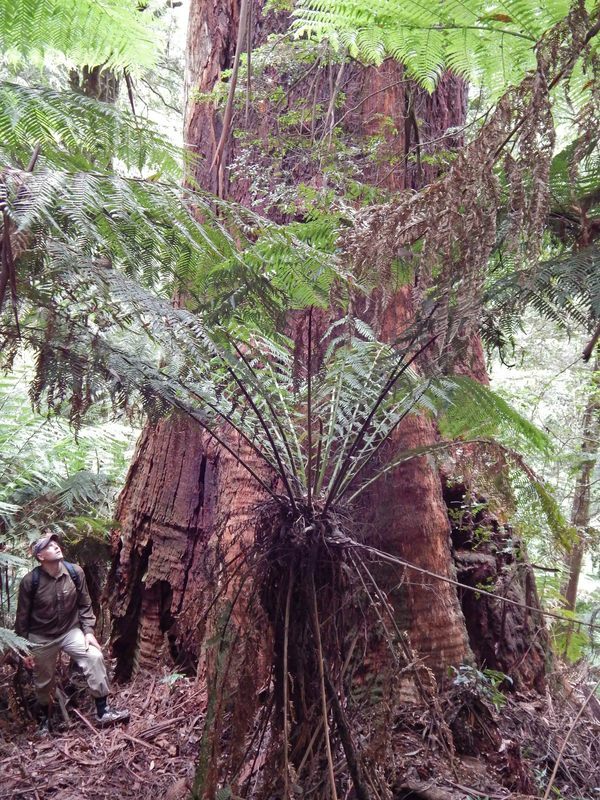 Above left, the slow tapering lower trunk of 'Brutus Maximus', above right shows the trunk remaining large right up to around 75m. The lower side of the base of 'Shield Maiden'. 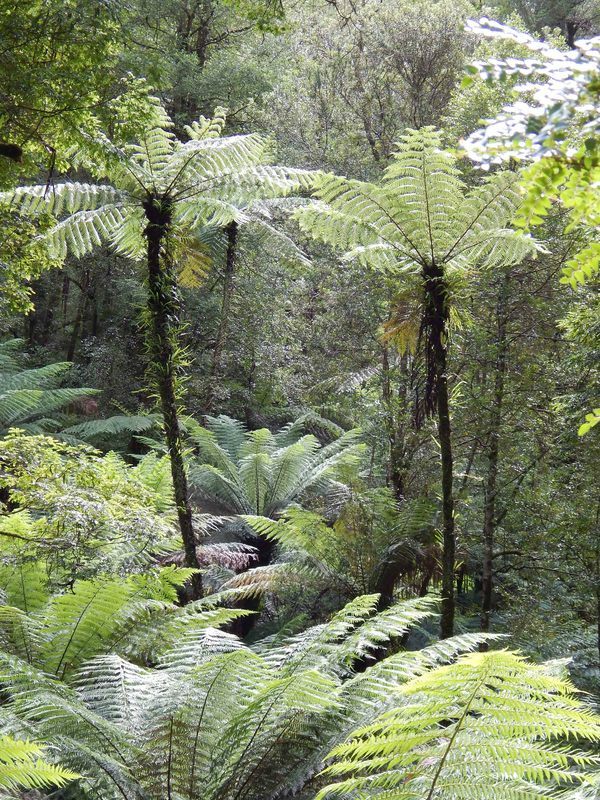 Over the centuries a huge amount of plant matter builds up and breaks down creating a fertile bed for mosses, ferns and larger plants like tree ferns, sassafras and myrtle to germinate and grow. 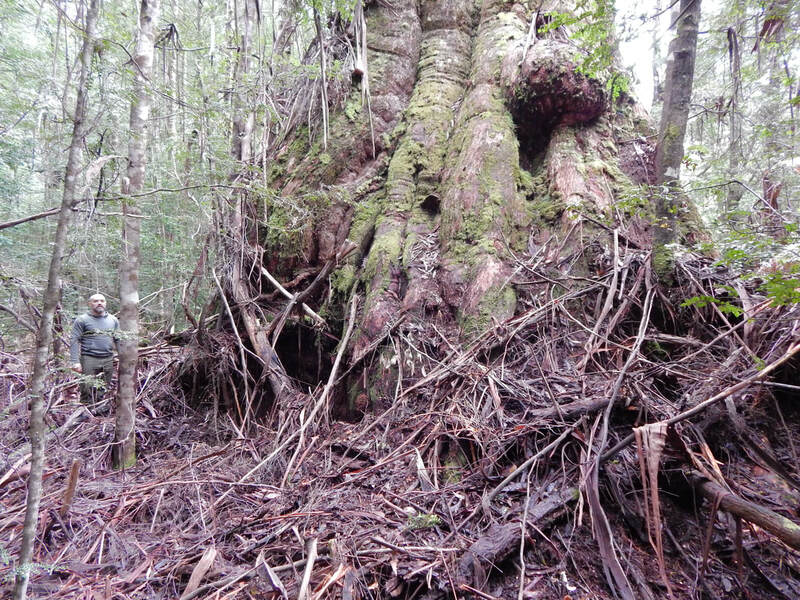 An eight hour off track walk through the gullies and ridges of the headwaters of the Upper Franklin river in early January 2017 has uncovered some very gnarly giant old trees. 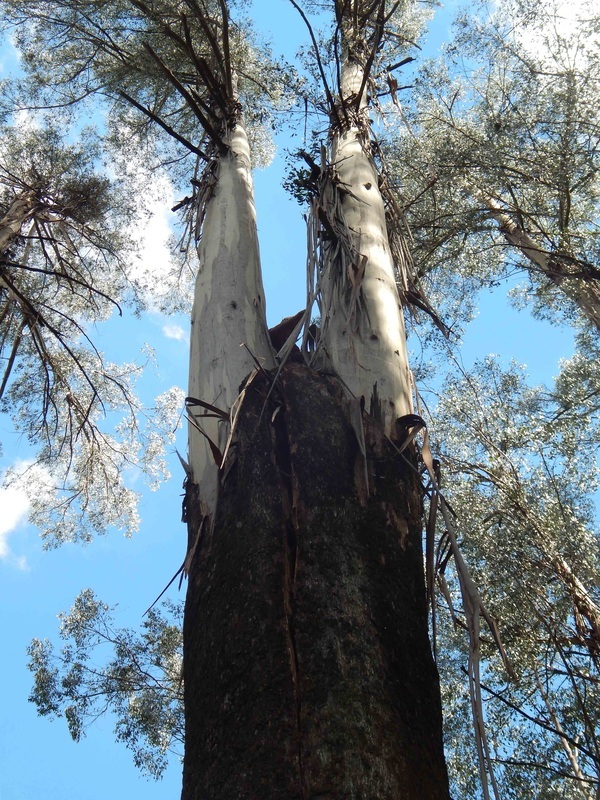 As is the case with most old Eucalyptus regnans in the Strzelecki Ranges, all of the 300-400 year old trees we saw had long ago lost their original crowns. Although some, like 'Octopia' (photographed below), had re-developed a complex lower branch structure and a full crown. 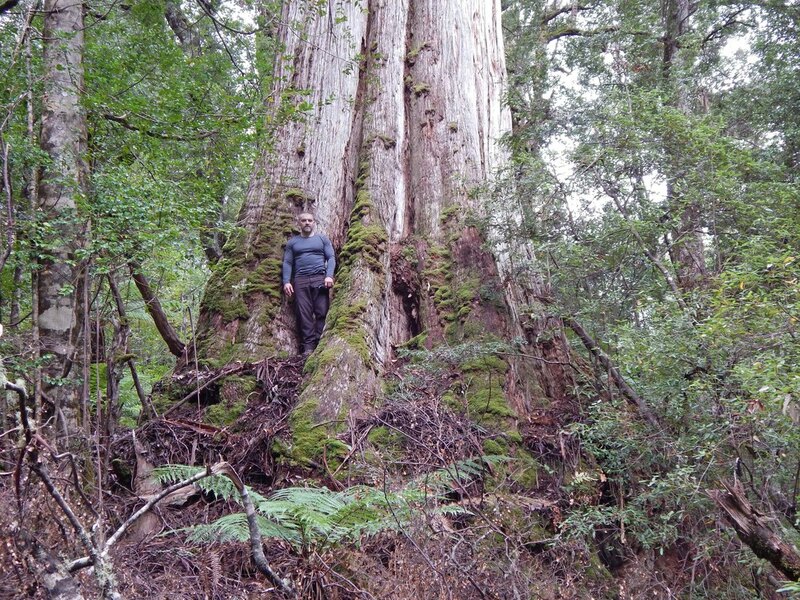 While older trees were scattered throughout the area, 'Octopia' was found in a small patch of very old forest which produced all the largest girthed trees of the day: 'Benedict' 14.3m, 'Franklinstein' 13.2m, 'Octopia' 13.1m with many more over 10m. 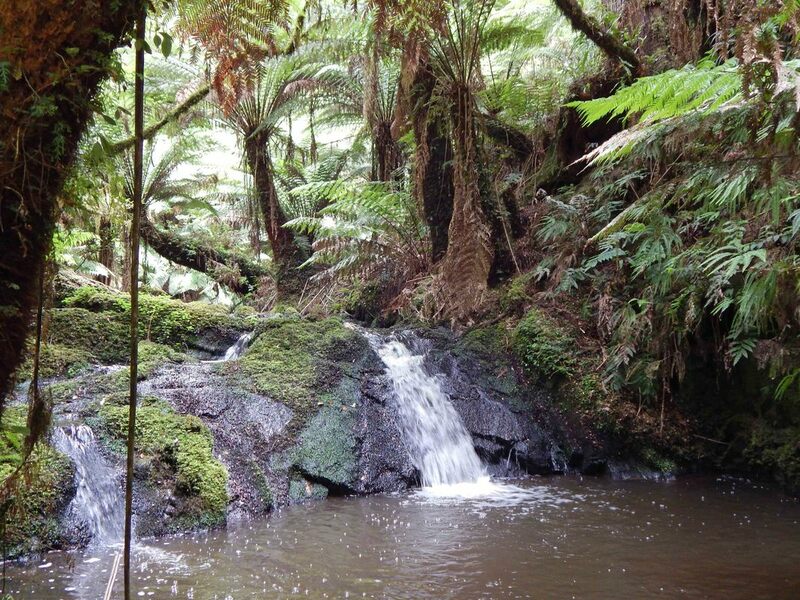 This part of the Strzelecki Ranges is also the only place on earth where the otherwise very rare slender tree fern, Cyathea cunninghamii, is actually abundant and was seen thriving in all the gullies we traversed. 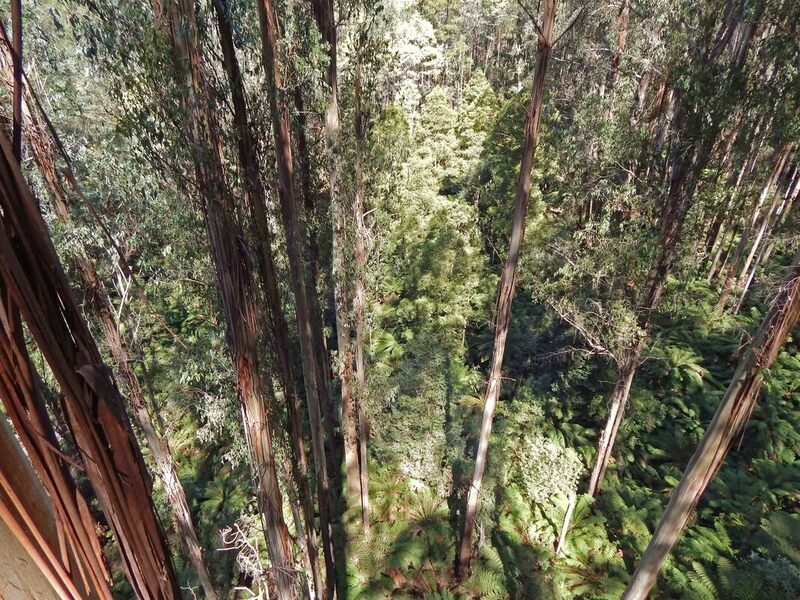 Recent improvements in the quality of the satellite images on google maps in some areas has helped me locate some impressive old trees amongst 20-30 year old logging regrowth off Nolans Road near Toolangi. The largest tree located I called 'Boss Nolan' - it is 10.5m girth but has a slow taper and a very large lower 25m of trunk including a 'fire window' about 20m up. In all there would be over 40 old trees surviving amongst the regrowth in the area and as they all have survived both the 1939 and 2009 fires, virtually all of them having fire scars and broken, decaying tops. A different concept of time! Two photos of 'Velvetine' taken 25 years apart show how little the tree appears to have changed in the time I first saw it - unfortunately the same can't be said about the person in both photos! 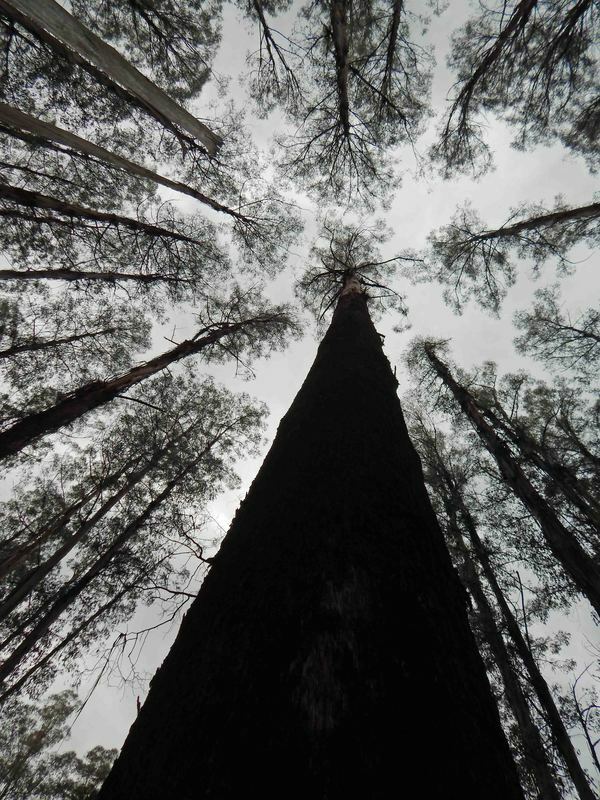 A fire that started in a nearby logging coupe in February 2015 impacted on a number of old growth trees growing along Kobiolke Fireline in the Latrobe State Forest near Powelltown. 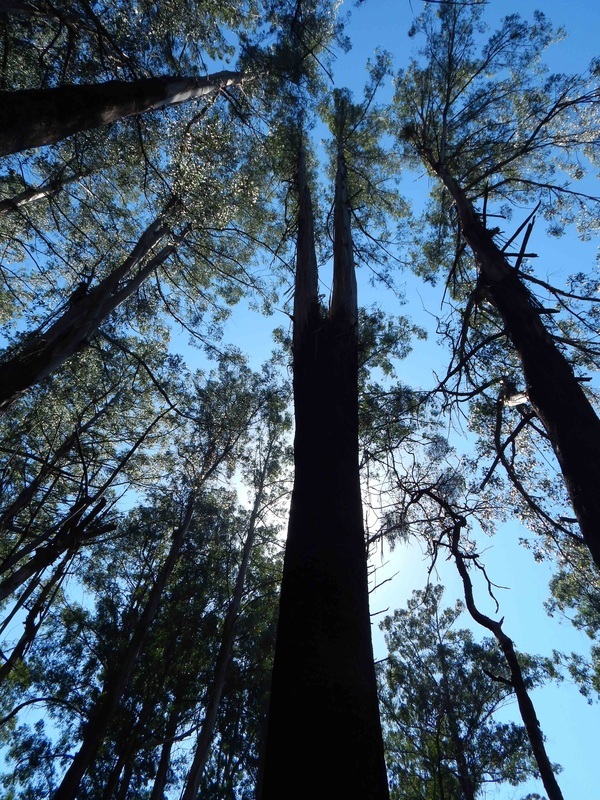 Even though the fire killed most of the understorey shrubs and wattles, the steep southerly aspect of the forest meant the fire did not burn fiercely enough to kill the old E. regnans trees that make this such a special place. Below are a few photos of the the 11.7m girth, 65m tall 'Belladonna' taken after recent (June 2016) snowfalls. 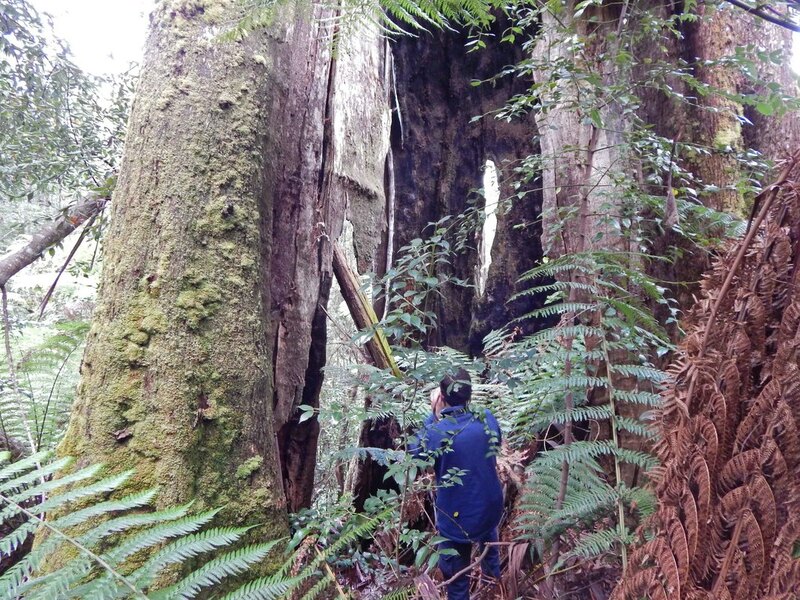 In mid-May I re-measured the tallest known 1939 regrowth tree 'Ferguson's Ghost'. 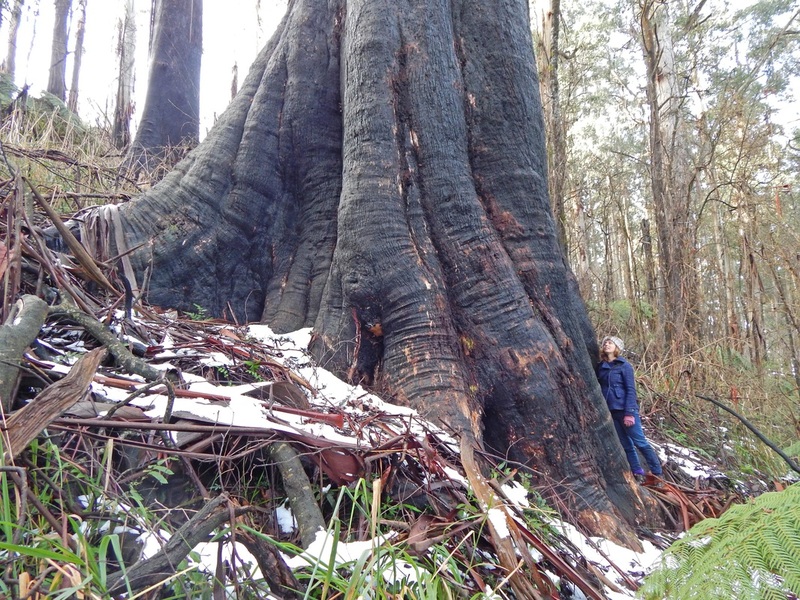 The laser measurement indicated the tree is now at least 85m tall.The tree is in excellent health and shows no ill effects of having an under-storey burn in February 2009 (the fires killed a number of nearby trees as can be seen in the photo below) Late autumn is a great time to visit the mountain ash forests, the temperature is generally cool, the forest is damp and lush and there is a profusion of different fungi species that can be seen. 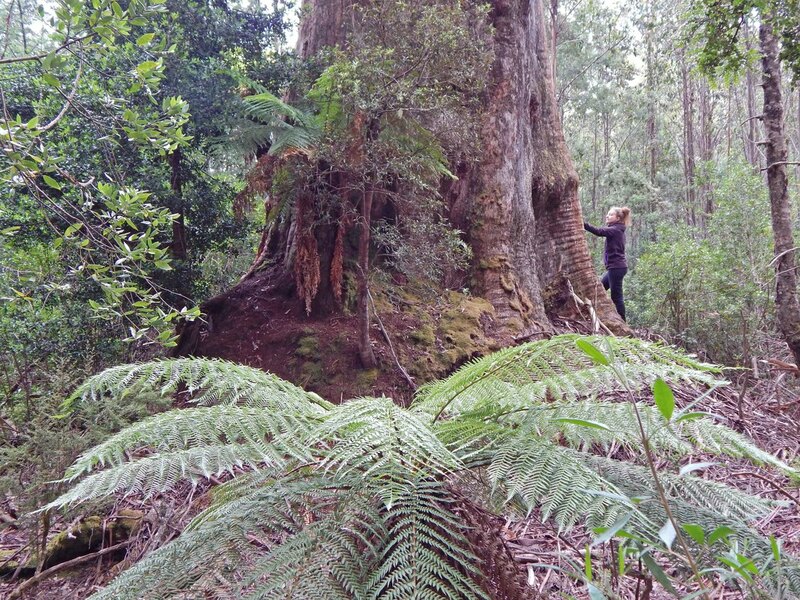 A large grey gum Eucalyptus cypellocarpa has been discovered in the Toolangi State forest by local conservationist Harley Sanderson. Named 'Ramah' the tree is 10.15m girth and 54m tall and boasts an impressive lower trunk as the picture below demonstrates. 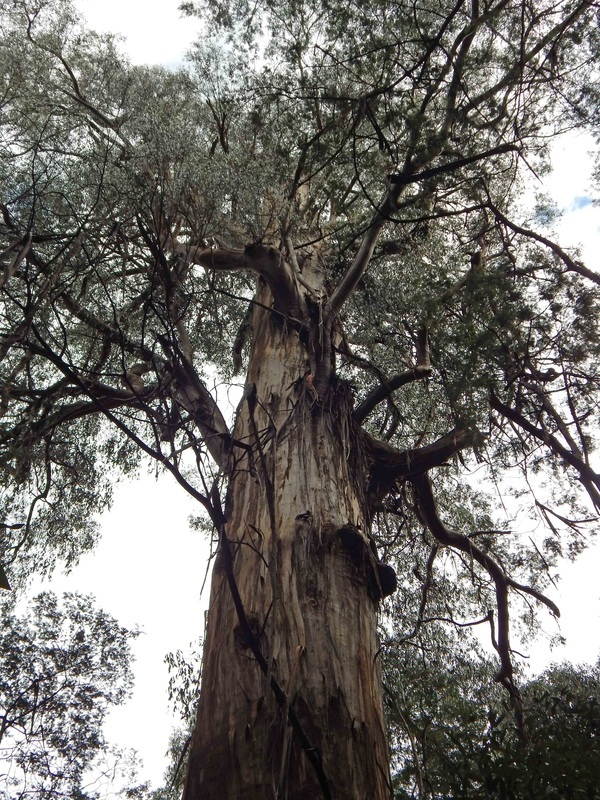 With an estimated volume of around 150-165m³ the tree will likely rank in the top 2-3 grey gums known. 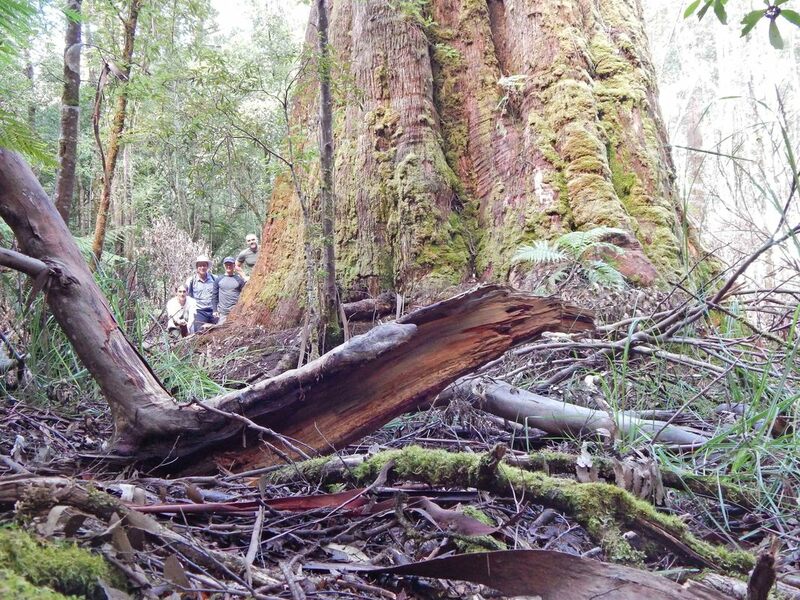 Hopefully the discovery of this tree and other nearby large, old hollow bearing grey gums will mean that planned logging in the vicinity will not proceed. 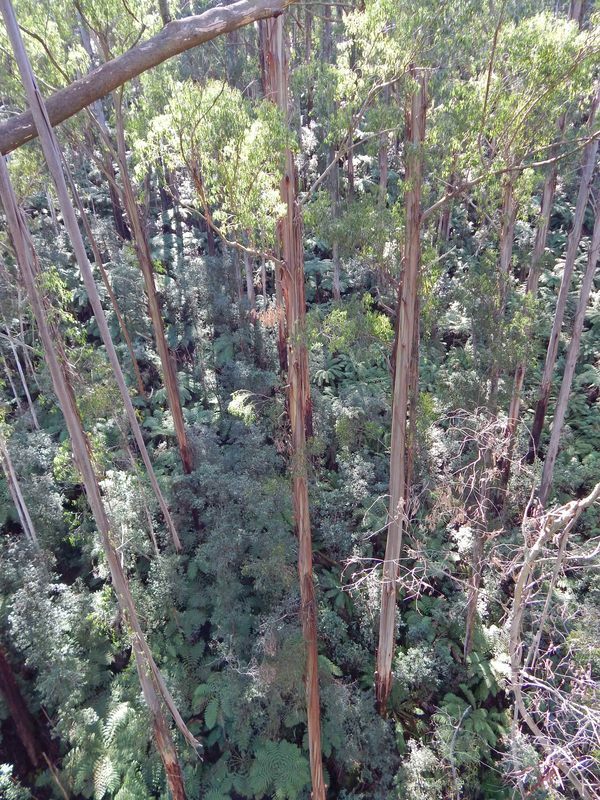 A recent assessment (August 2015) of the 87.6m tall tree 'Double Decker Dindi' revealed a further deterioration of its condition. The taller uphill fork is now leaning into a neighbouring tree and the split from the fork 14m up now almost goes right to the ground. In this condition it is not able to be saved using bolts and cables. It will be interesting to see what will happen to the downhill side fork once the uphill fork falls right away. At the moment this fork is not leaning and is around 86.5m tall. 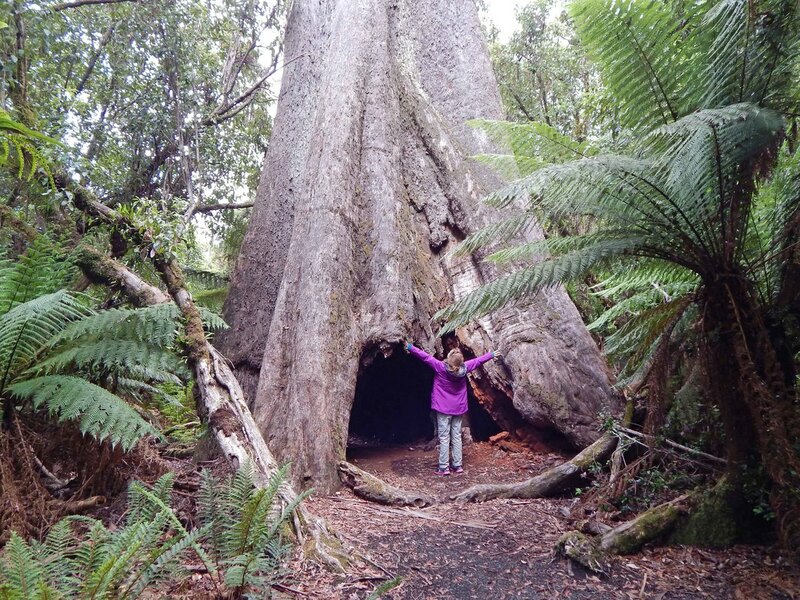 Until recently 'Blackbeard' was regarded as Victoria's largest living tree with a volume of 245m³.However, a winter storm back in 2014 sheared off part of Blackbeard's upper trunk. Recently I went to assess the damage and found that the tree was now 57m to where the trunk was broken - a loss of 16m of trunk from it's original height of 73m. 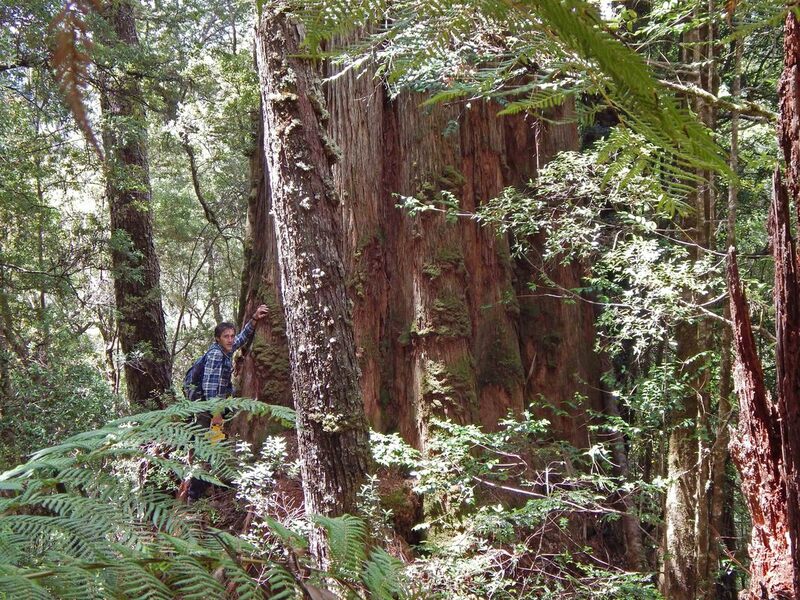 While this part of the tree was not massive it still meant a loss of around 15m³ of wood volume, so the tree is now around 230m³ and ranks about 4th or 5th in the state. The dead top of 'Blackbeard' taken in 2010 - this whole section has since fallen, taking a considerable amount of living branches with it when it fell. 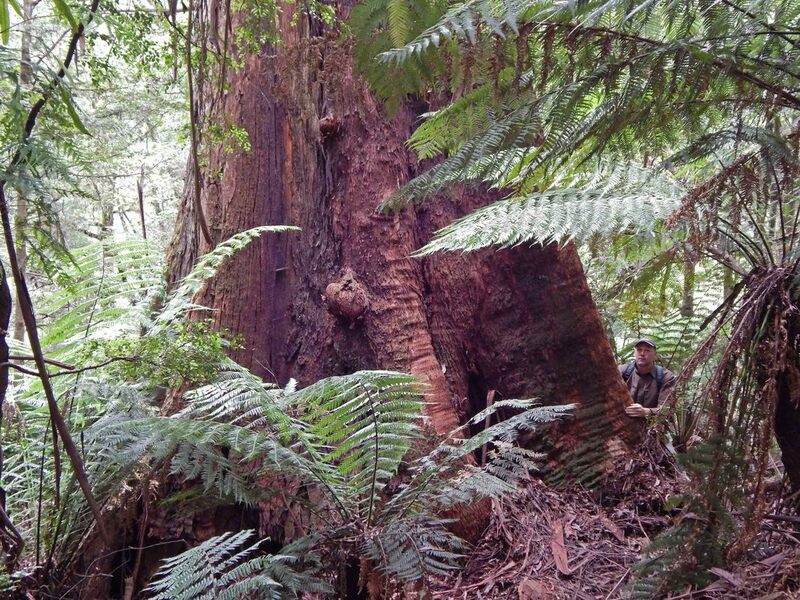 In late June 2015, an off track search of forest in the Great Otway National Park uncovered some wonderful 'new' giants. 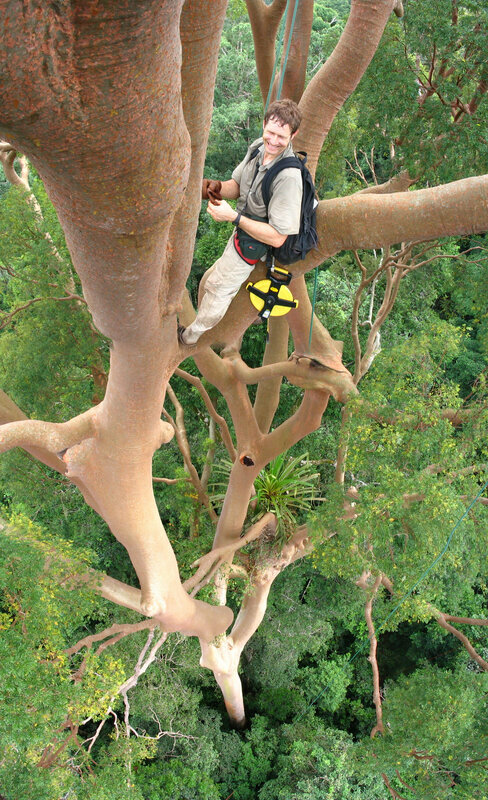 At least twelve trees between 12m and 14.9m girth were measured and many more in the 10m+ girth range. 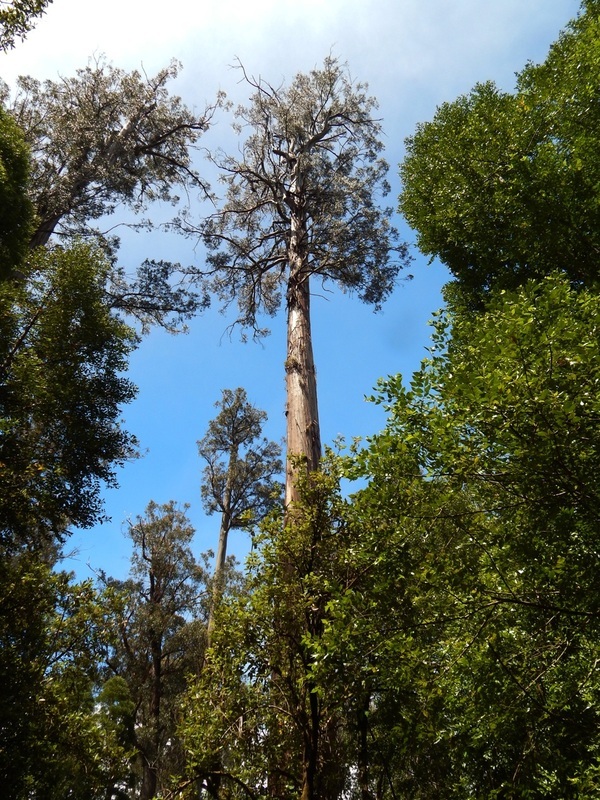 Highlights of the trek included the discovery of 'Grumpkins' with its enormous lower trunk, the 'Vim Vitale', possibly the equal largest Eucalyptus viminalis in the state and 'Sammy Spreadwell', with a girth of 14.9m. Off track walking in the Otway ranges is often a nightmare with devilishly steep and slippery gullies combined with dense vegetation making progress very slow. However, in this particular case, the fact that we covered only 1.5km in 6 hours was more due to the fact that there were so many great trees to measure and photograph because the terrain, vegetation and weather were pretty friendly by midwinter Otway standards. 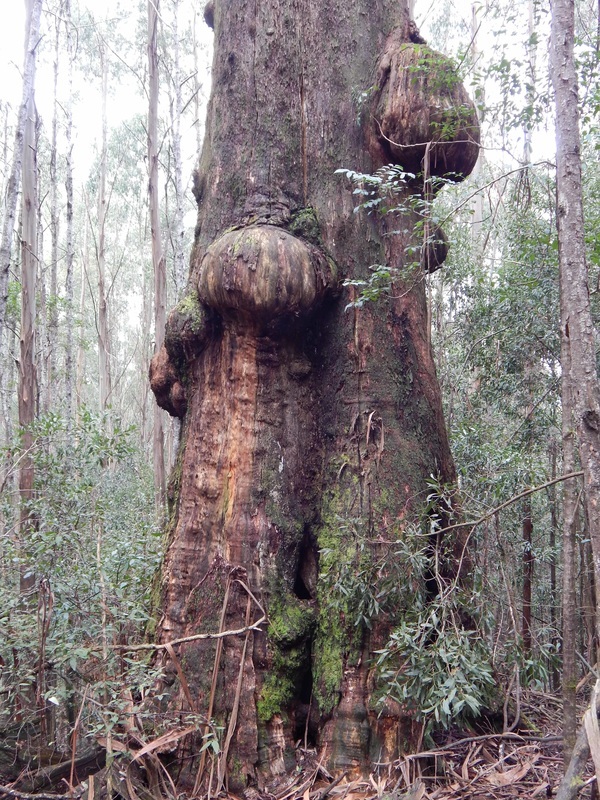 The huge lower trunk of 'Grumpkins'. This tree is broken at about 35m up, however, its lower 20m is huge. 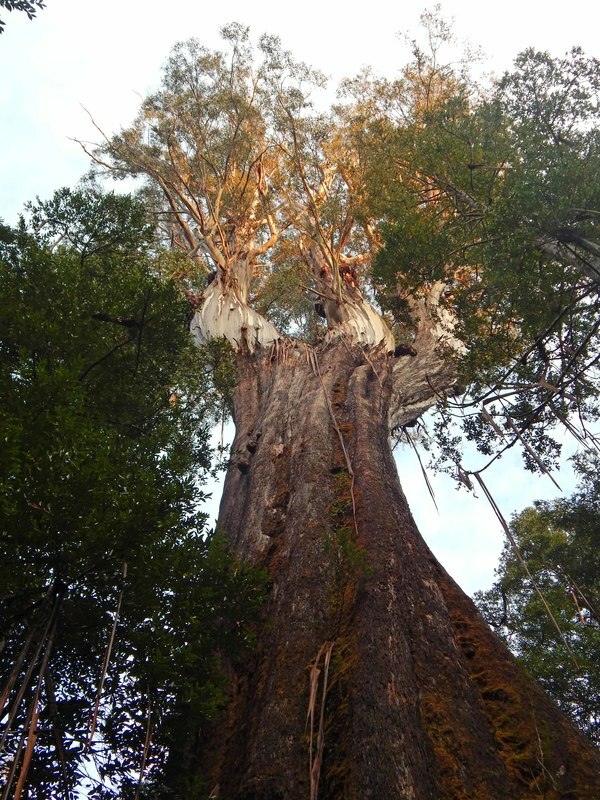 In late March 2015, a dedicated team of four climbers lugged their packs 4km up an overgrown track to climb and measure the Lonely Tanjil Titan - a huge mountain grey gum, Eucalyptus cypellocarpa, located a few kilometres east of the tiny locality of Tanjil Bren. We found the tree had decayed significantly since I first noted it in 1992. 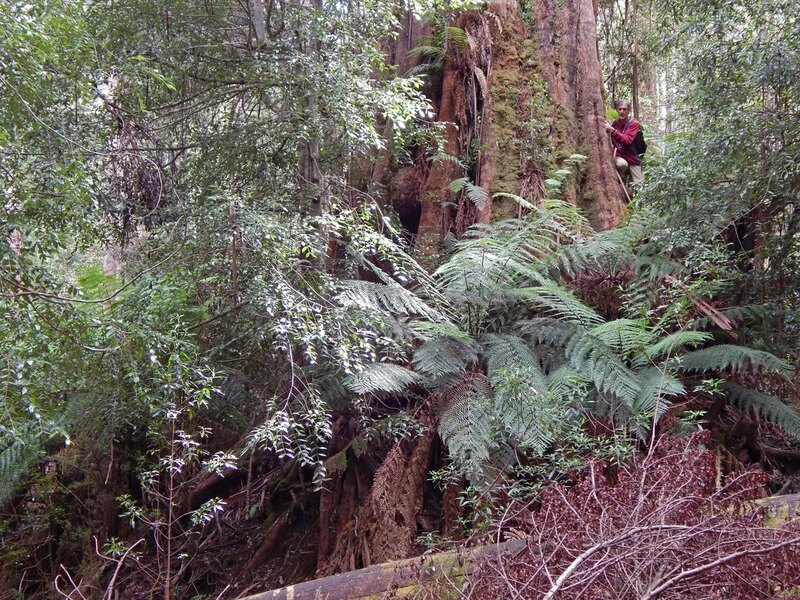 I re-measured it in 2006 where the top of the trunk was dead but still reached 64m tall. Now its main trunk is broken at about 33m up, however, a huge but dead original branch that is still hanging onto the shell of the trunk rises up to height of 44m. Despite the loss of about 25m of the main trunk, the tree still contained 163m³ in its reduced state due to its stove-pipe like lower trunk. 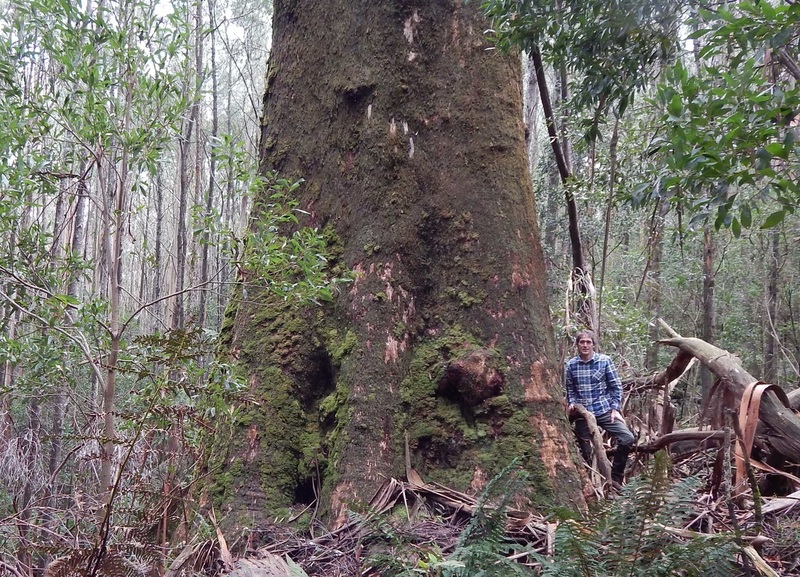 This makes it the largest measured Eucalyptus cypellocarpa, however, the huge mountain grey gum at Ellery Camp has not been accurately measured for volume (see East Gippsland). Interestingly, once again there was an abundance of arboreal lizards that had made their home high up in the canopy of this aged hulk of a tree. Grant Harris climbing the Lonely Tanjil Titan - the orange colour in the trunk is actually the sun shining through the smoke haze of a nearby regeneration burn! The good: Today, March 8th, Tom Greenwood and I went back to Double Decker Dindi to climb and measure it. 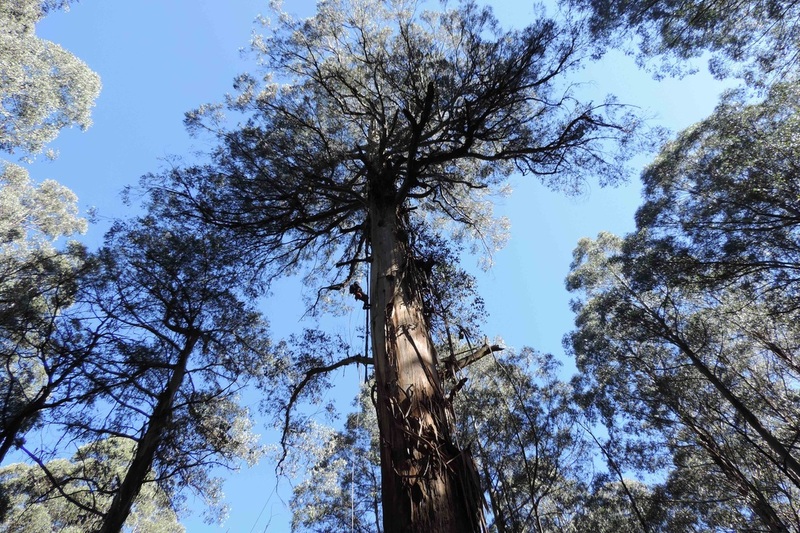 The tape came down and the tree came in at 87.66m tall – currently the tallest living measured tree in mainland Australia! The bad: The tree has a major and apparently recent split at its bifurcation that runs for about 6m down from where the two trunks originally separated (see photo below). 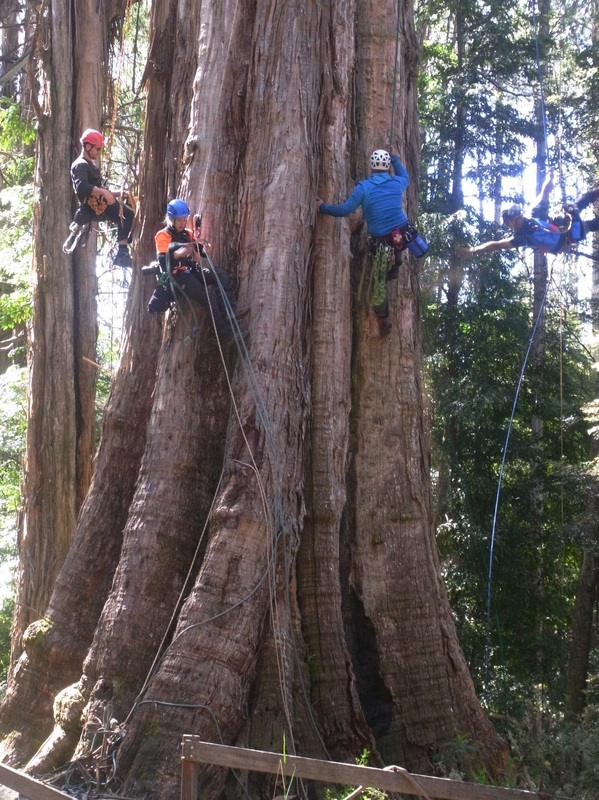 It is unclear how long the tree will remain upright – there is a possibility we could get a team together and cable together the upper trunks and then perhaps bolt the tree at the split. 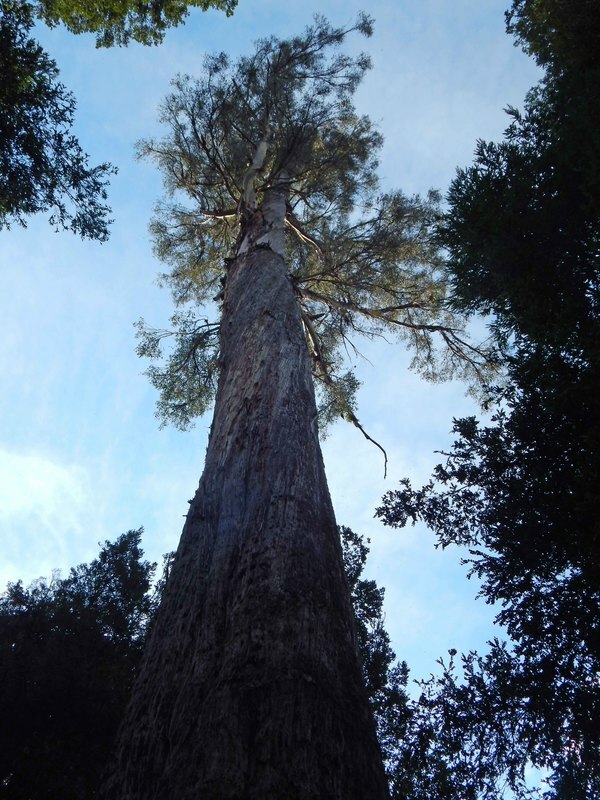 The Tallest tree in Mainland Australia – A new Contender! 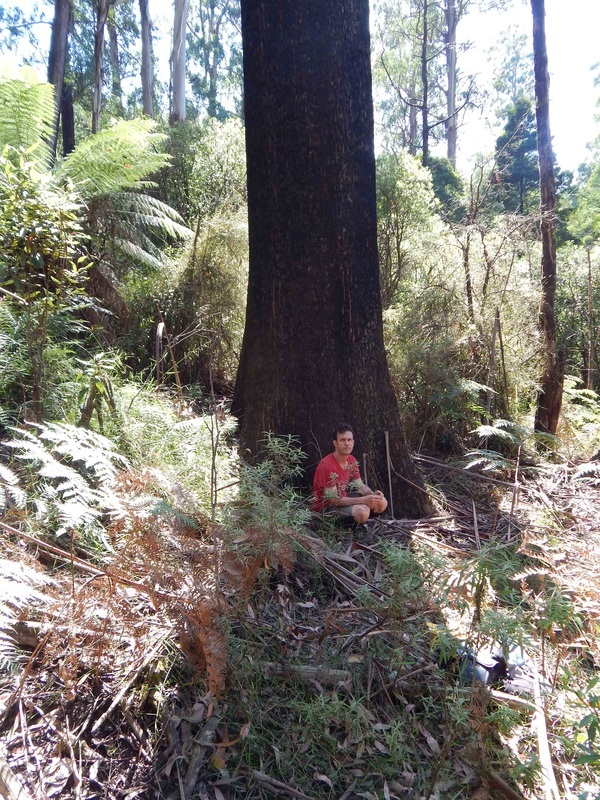 On February 8th 2015, I measured a ‘new’ contender for the title of tallest living tree on the Australian mainland. 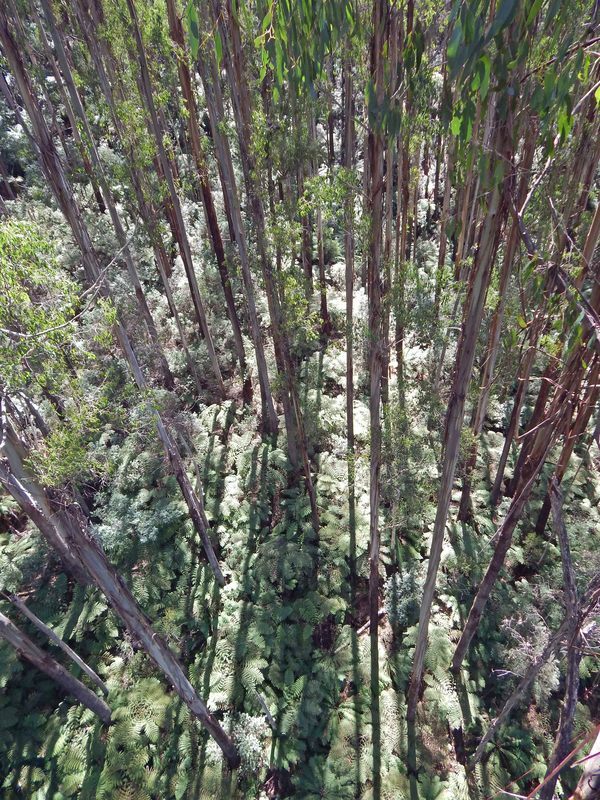 This tree appeared on old (2007) LiDAR mapping from Vicforests at over 84m tall, but no one had actually gone to the tree to get a more accurate height using a laser. 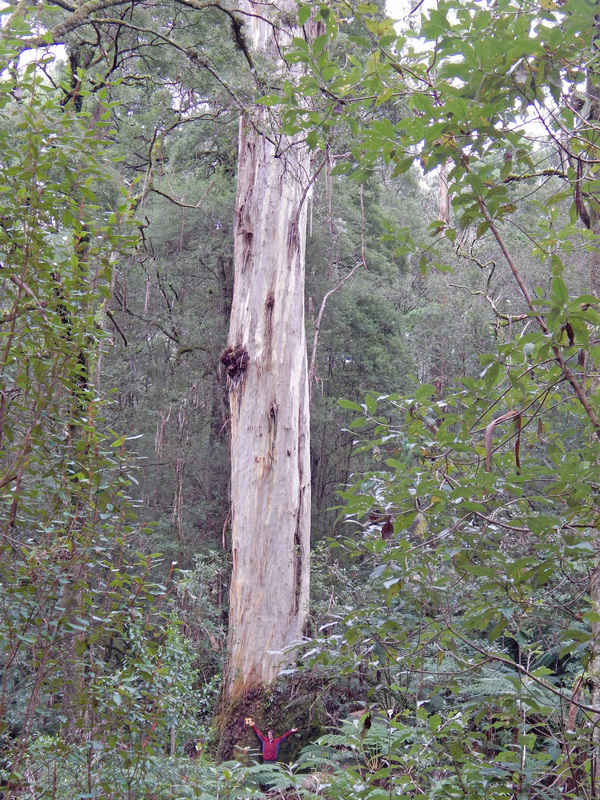 This regrowth tree with a healthy live top is located in the Toolangi State Forest, on the lower section of a gentle ridge not far from a small gully and creek – it is around 1km off a primary gravel road. This mountain ash tree is a stunner – forking at around 20m up with both boles remaining pretty clear for a long way up. Using the photo below as a reference, the left fork was lasered at 87m tall while the right fork was at least 86m tall. My companion on the day Pat, while scratched from some of the wire-grass thickets we had to walk through, definately approved of the name I have given the tree: ‘Double Decker Dindi' (see second photo below). 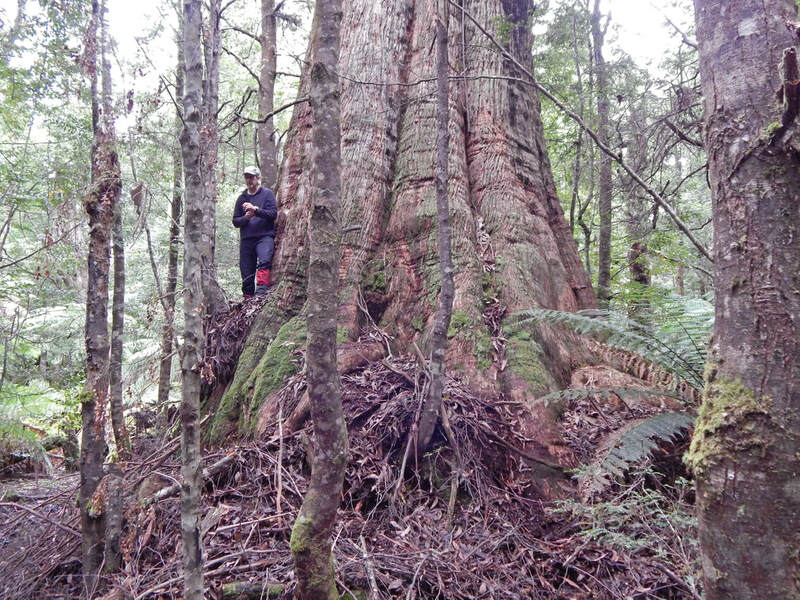 Double Decker Dindi's DBH is 1.62m making it highly likely that the tree originates from fires in 1919, like other large regrowth Eucalyptus regnans trees in the vicinity. 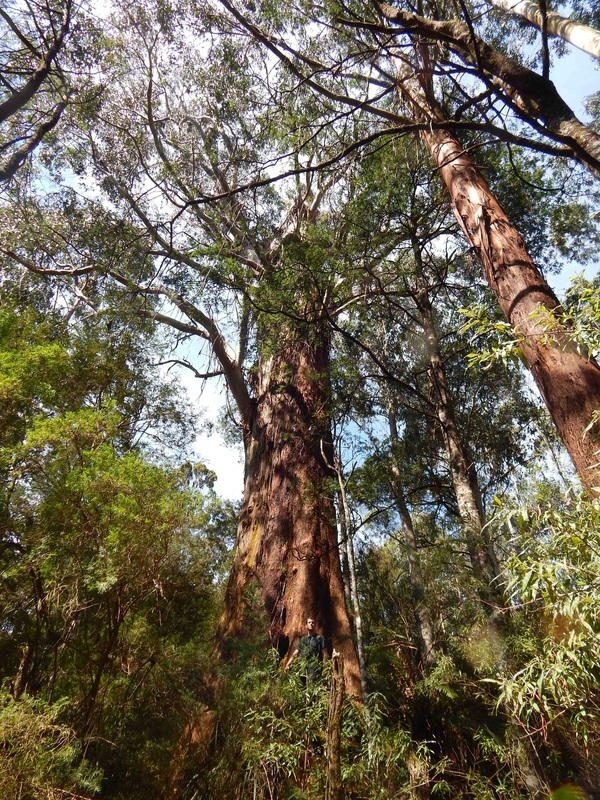 In October 2014 the tallest known tree in the patch of forest below William Ricketts Sanctuary off the Mt Dandenong Tourist Road was climbed and measured by Tom Greenwood and Grant Harris. I had lasered this tree from the ground a number of times in the past - at 82m in 2001 and 84.5 in 2011 - and was pleasantly surprised with the current total height of 85.68m which makes it 5th on the mainland's tallest measured, living trees. The site appears to be exceptionally fertile with at least 5 other trees in the stand exceeding 80m in height with 2 of them having a girth greater than 8m. As the morning light filtered through the surrounding forest I took the photo below. 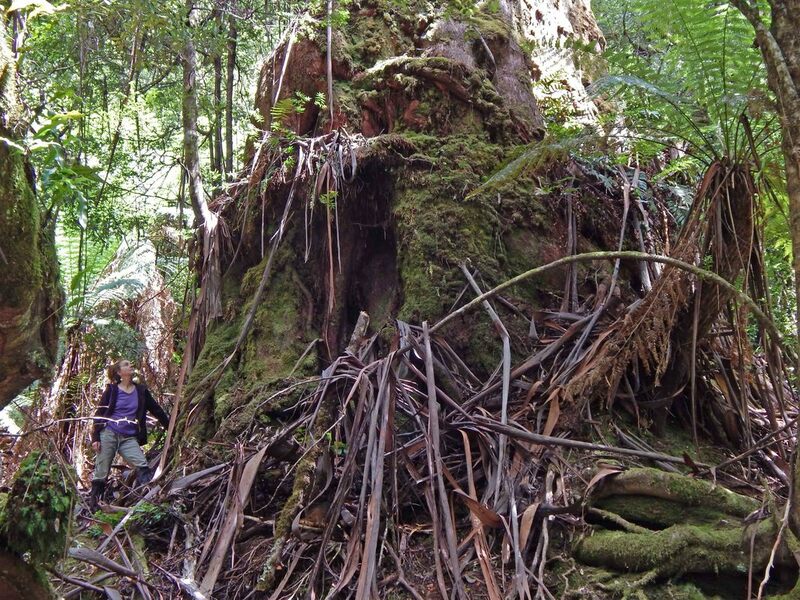 A September 2014 expedition to uncover giant remnant Eucalyptus regnans in the Strzelecki Ranges unearthed a half dozen previously unknown large trees between 11m and 12.5m girth - the largest in volume was the 'Ridgie Ruin' pictured below. It had a probable wood volume over 170m³, despite it being a hulk with a broken trunk at about 33m up. 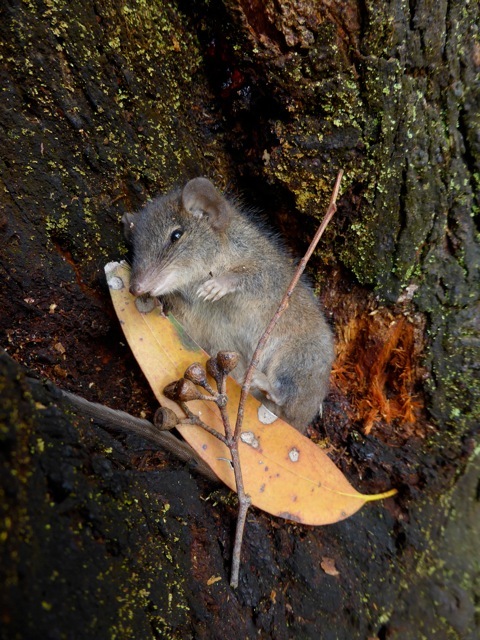 In late April 2014 a team of climbers measured the newly named and discovered tree, 'His Royal Antechinus'. 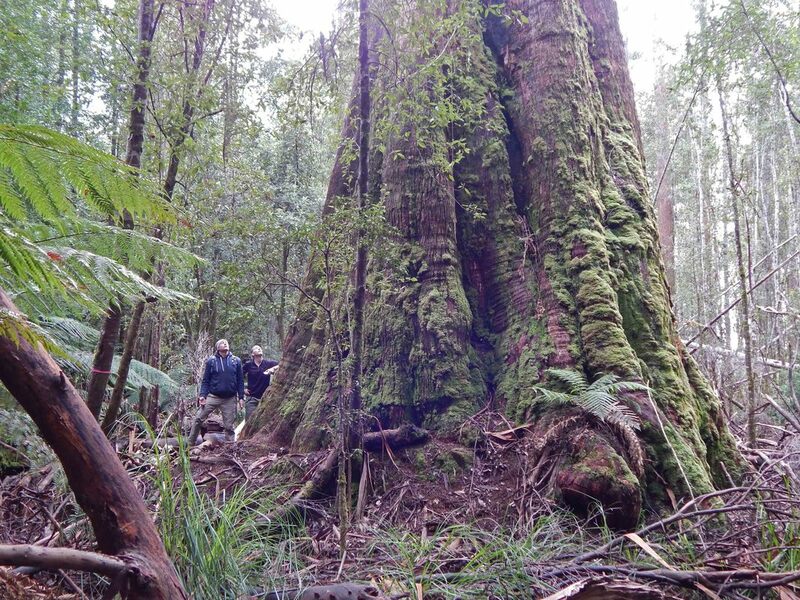 The tree turned out to be considerably larger than first thought and, at 206.5m³, it now ranks as the 10th largest tree measured in Victoria. 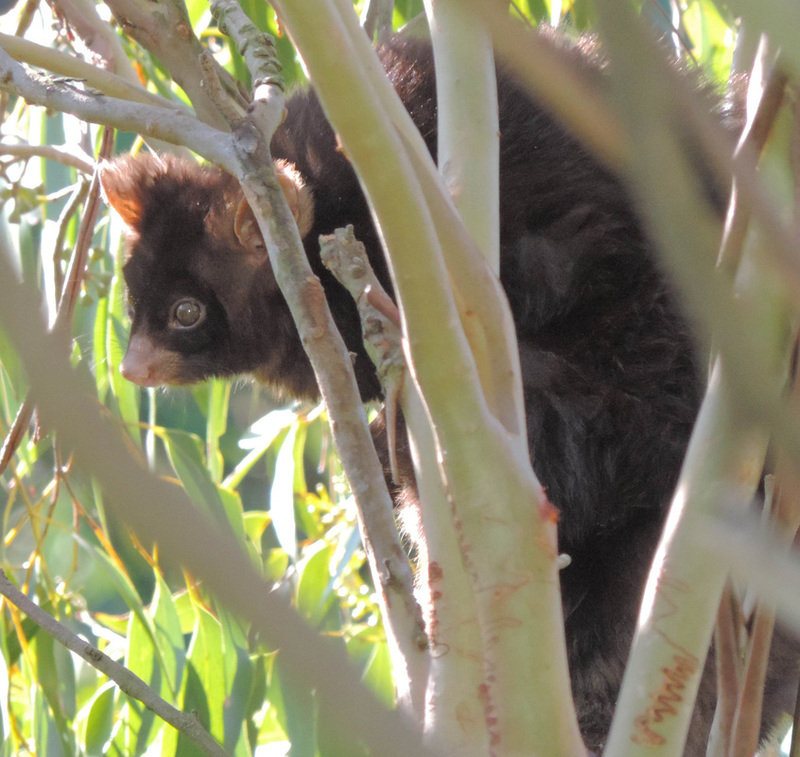 What was perhaps more impressive on the day was the appearance of two greater gliders (Petauroides volans) in the tree. One of which we had the privilege of seeing glide from the top of the tree down to the lower branches. The other stayed high up on a small outer branch, warily watching the activities of the strange noisy creatures who had interrupted his daytime sleep. Greater glider 55m up 'His Royal Antechinus' - Photo by Dan Dass, courtesy of Grant Harris' camera! 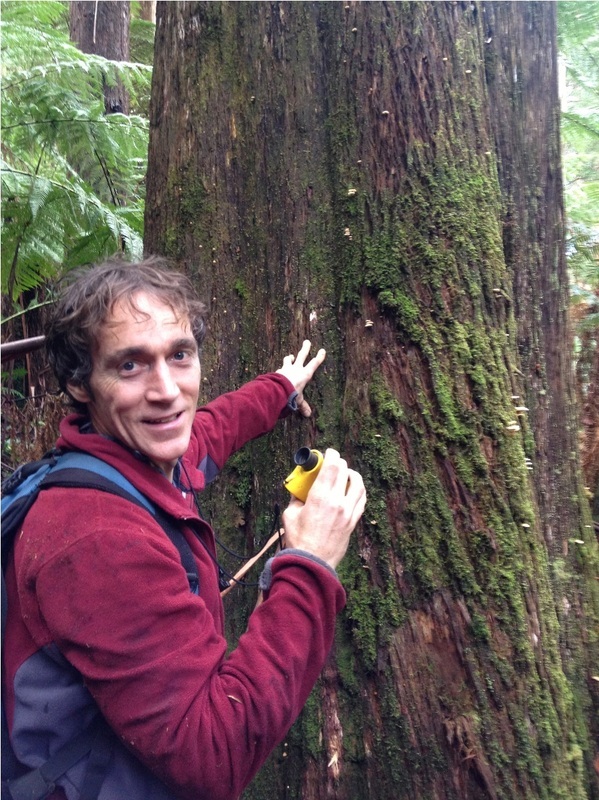 Environmental scientist Grant Harris has written up a paper on our sightings of Spencers Skink in very large, old Eucalyptus regnans trees in the Central Highlands. Furthermore, the editors of the Victorian Naturalist journal have gratefully given us permission to publish the paper below. Presumably having 'mated' himself to death as is the fate of all males of the species! 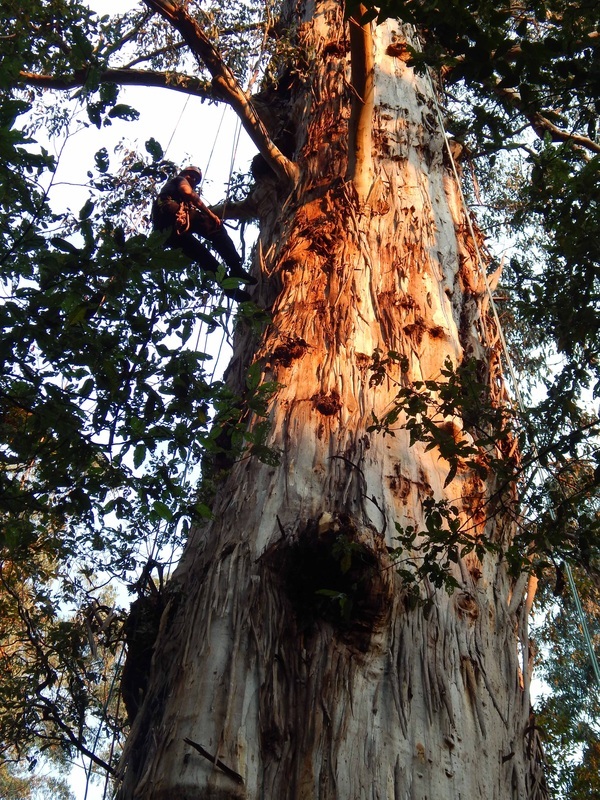 In late November 2013, two giant shining gums, Eucalyptus denticulata, were climbed and their volumes measured. The largest, 'The Whitelaw Tree' came in at an impressive 229m³ in wood volume. 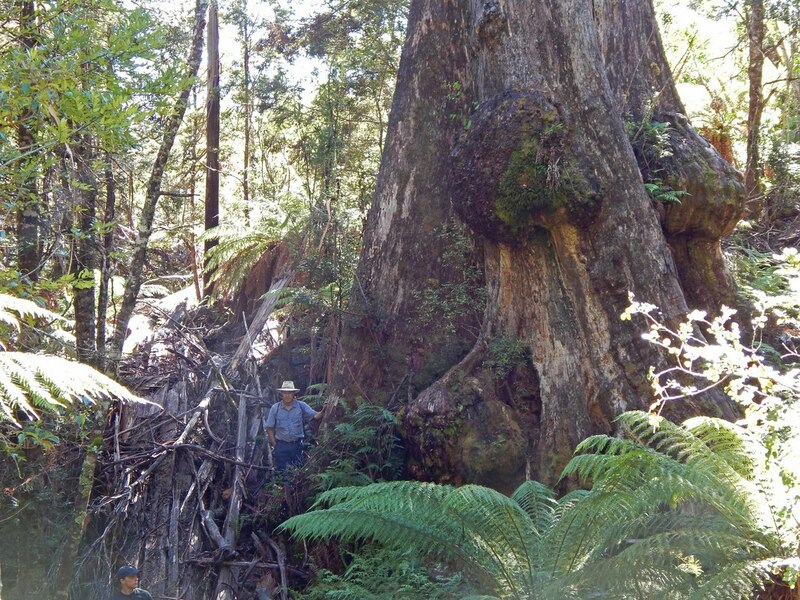 This makes it the 5th largest tree in Victoria. Its girth was 14.9m at breast height while its trunk was broken at 50m. The second tree, named 'Hairy Maclary' due to its very shaggy appearance, contained 187m³ in trunk wood volume. These shining gums are growing at 1000m asl: winters are long and cold with regular snow falls, summers are mild. It is therefore highly likely they are between 450 and 500 years old. 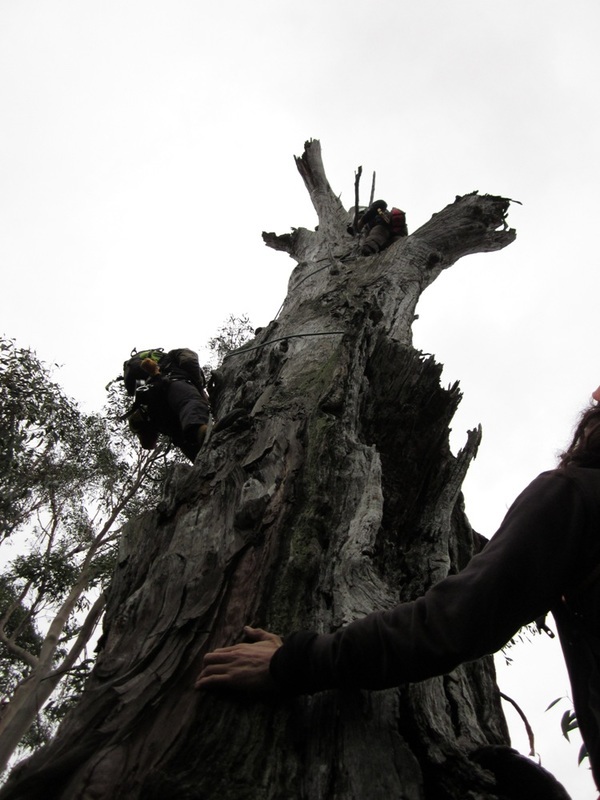 Below, my climbing companions, Grant, Julia, Ewan and Dan are enjoying doing the final tape wraps on the Whitelaw Tree. 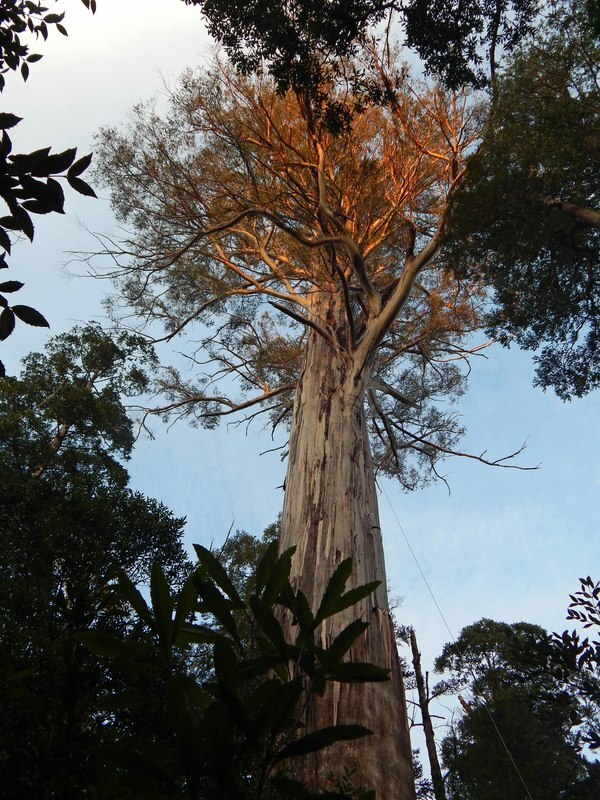 In late October 2013, 'Wotan's Spear' was climbed by Tom Greenwood and Grant Harris and its height confirmed at 85.2m. 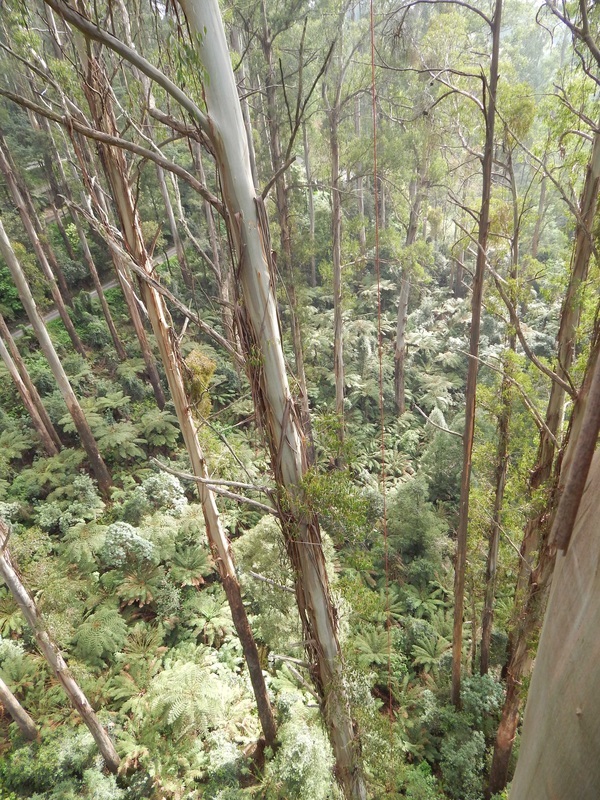 The photo below shows a view of the magnificent 1926 regrowth forest taken from the tree. 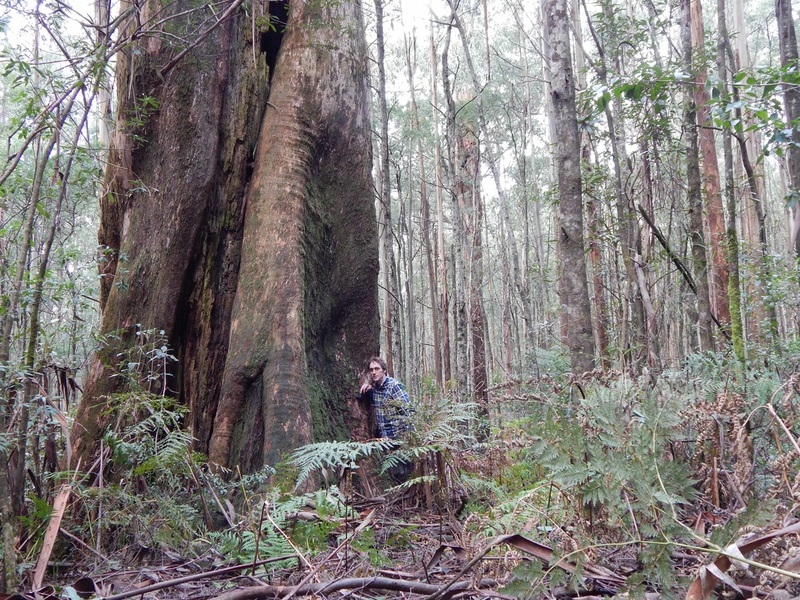 A recent (September 2013) off-track trip deep into the Gunyah area of the Strzelecki Ranges uncovered a surprising number of ancient mountain ash trees with very large girths. While most of them had lost their tops generations ago, what they lacked in height they made up for in their gnarly, buttressed bases, often lined with moss and filmy ferns. 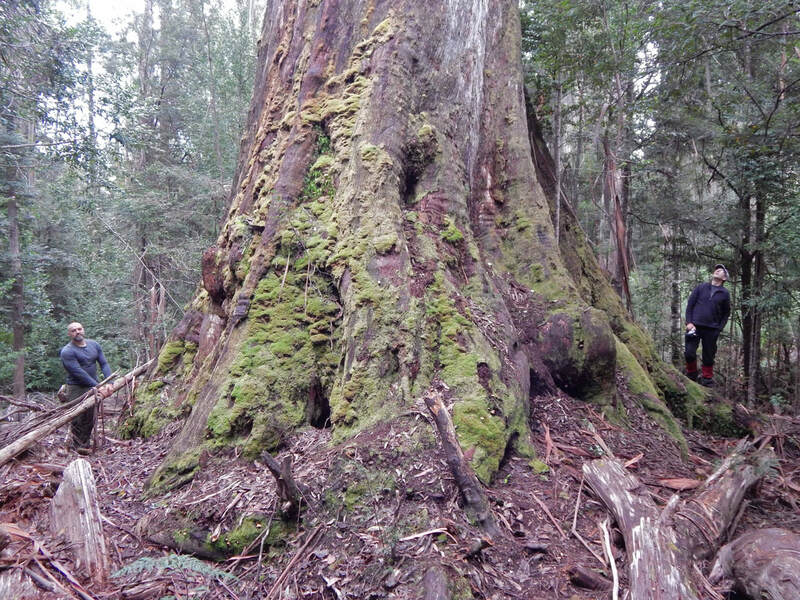 The biggest tree of the day came in at an impressive 15.7m girth, making it one of the largest bases in the State. easily appreciate this magnificant mountain ash tree. Take Meyers Creek rd, head north 10km through some fantastic 1926 regrowth mountain ash forest along Meyers creek scenic Reserve. Turn right into Sylvia Creek Rd, travel along 10km, passing WirraWilla Rainforest walk and just past Tanglefoot Picnic ground. take Kalatha rd on the left. The car park for the walk is about 1.5km down Kalatha Road. 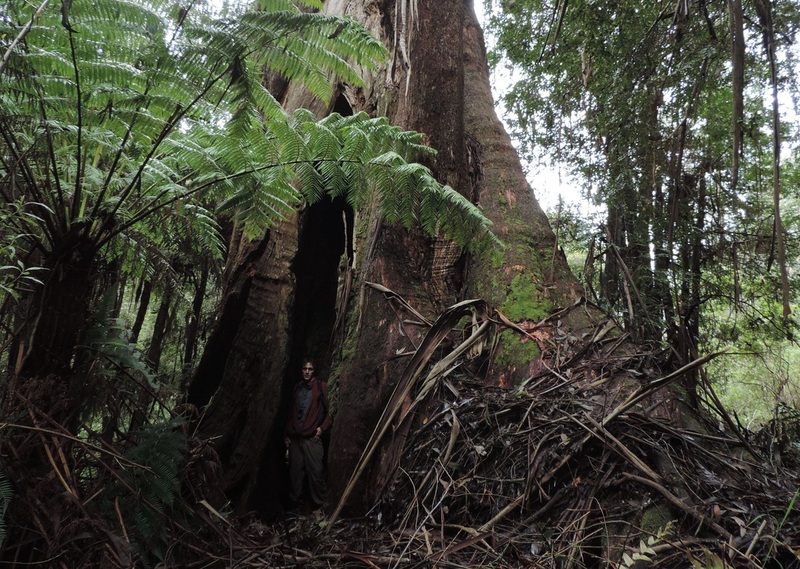 In early July 2013 I measured a tree along the Tomahawk Creek, Beenak, at over 85m tall. 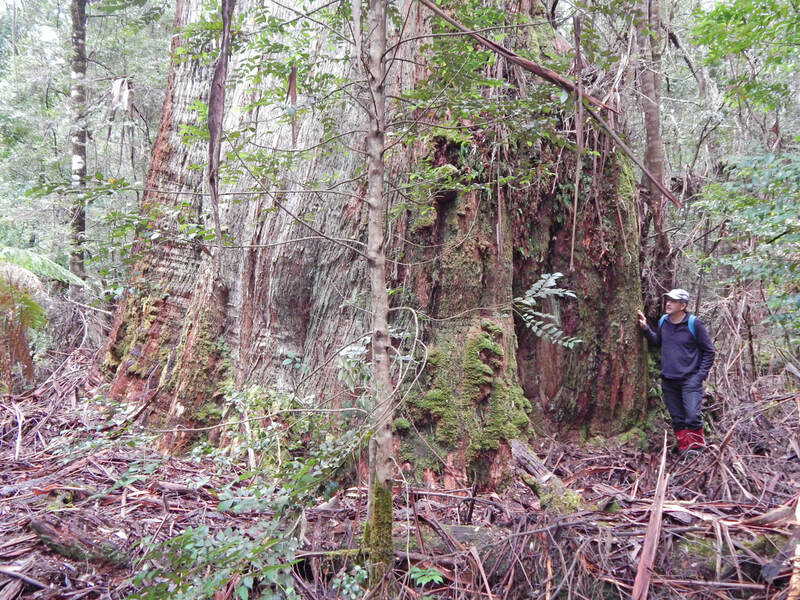 This tree is 2km further upstream from the 'Bunjil's Spear' tree and associated patch of very tall trees. The tree is superbly formed and only about 1.2m in diameter (see below). My companion on the day, Brian Walters, gave it the evocative name 'Wotan's Spear' It appears to be of 1926 origin and hopefully has many years of growth left in it. I recently remeasured a tree I had originally noted back in 1992 - I called it the Fireline Beauty and it grows off Kobiolke road, south of Powelltown. 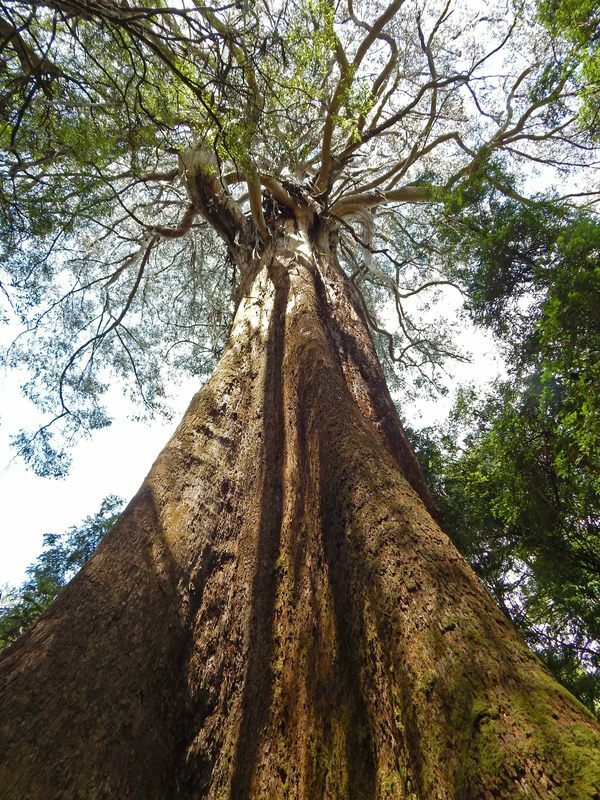 It is the tallest known of the trees that exceed 175m³ in volume. The tree is on a steep slope and the height is around 83m - a number I hope to get more accurate when the tree is climbed. 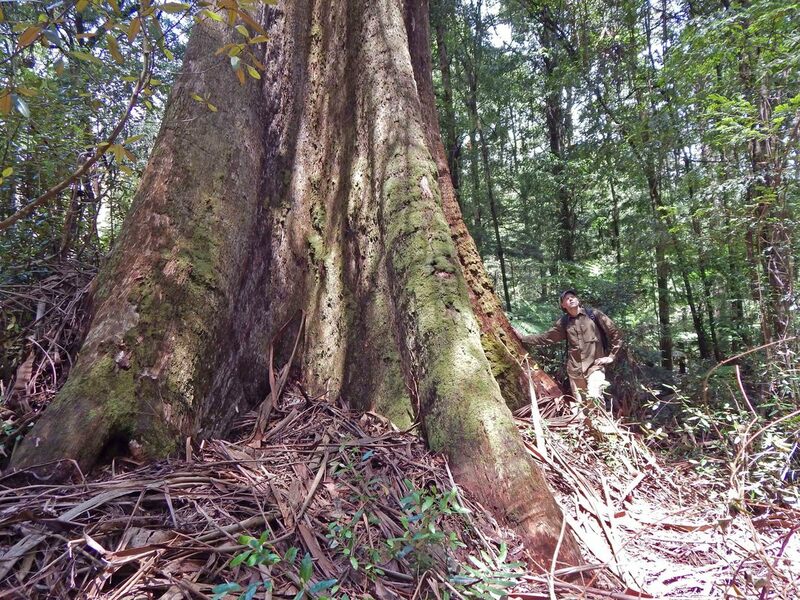 An impressively large shining gum, Eucalyptus denticulata, was found not far from the Whitelaw tree (same species). 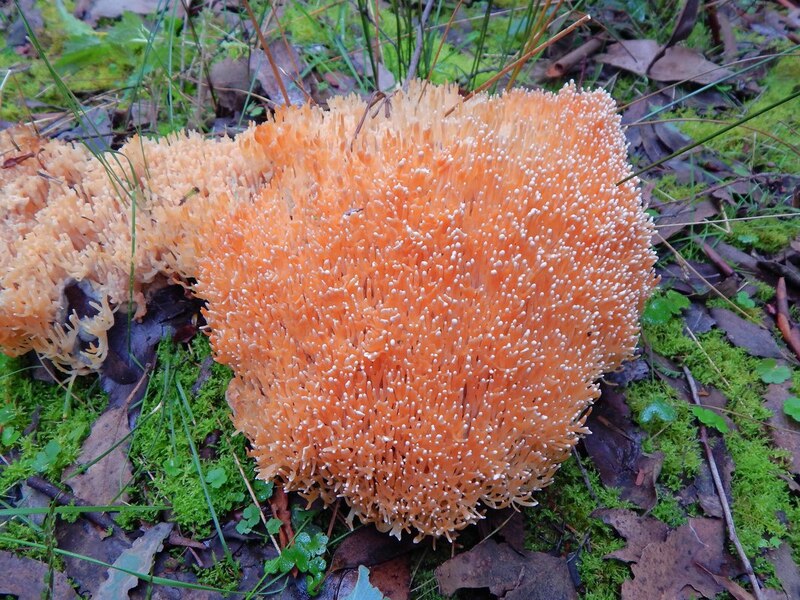 It grows at around 1000m above sea level. It is 10.7m girth and about 58m tall. It has an incredibly gnarly and shaggy appearance - so I have named it 'Hairy McClary'.